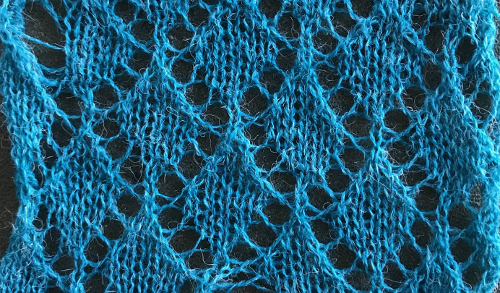 Over the years I have avoided ribber fabrics that involve hand manipulation of stitches in addition to patterning. 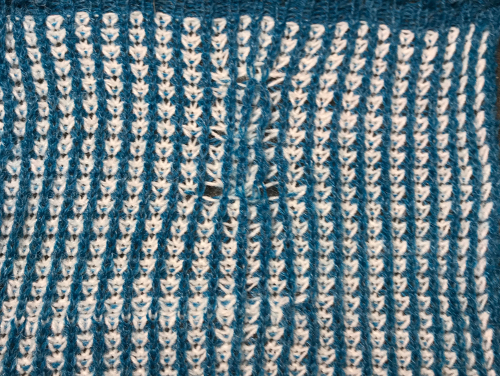 Runaway stitches are hard to see and repair. 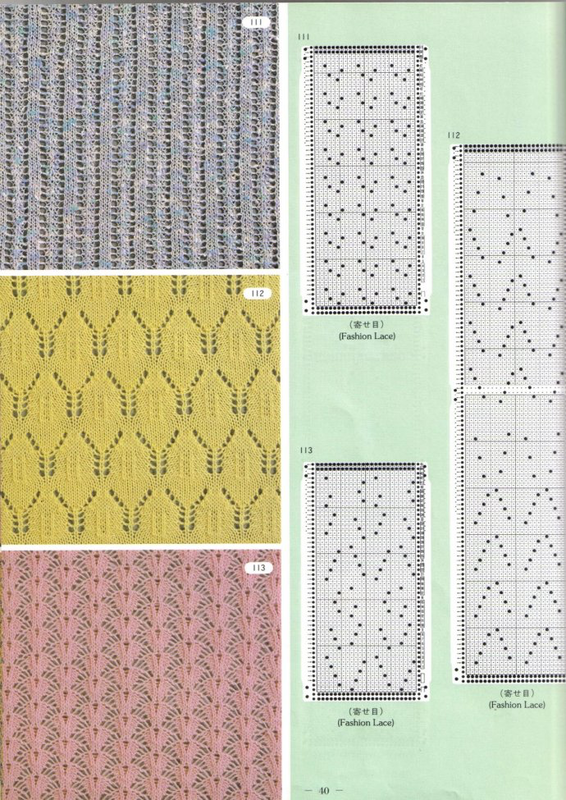 In these fabrics transfers are made by hand with multiple transfer tools. 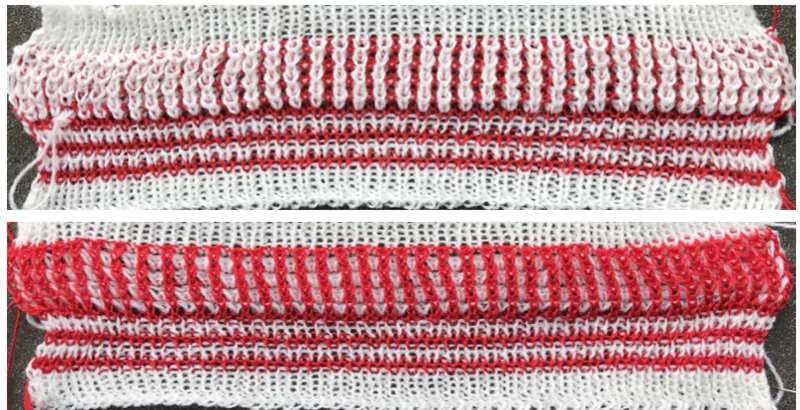 As stitches are moved, the last of the stitches transferred on the purl side (in this illustration 4 stitches), one will lie directly behind one of the stitches on the main bed (marked in red), sharing the same needle hook space. As the next row is knit, the needle emptied by the transfers picks up a loop. 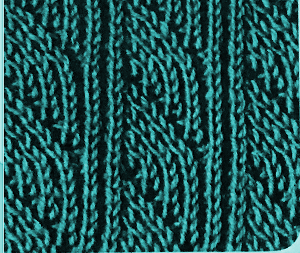 The following knit carriage pass will complete the stitch on the needle holding the loop, and the eyelet. 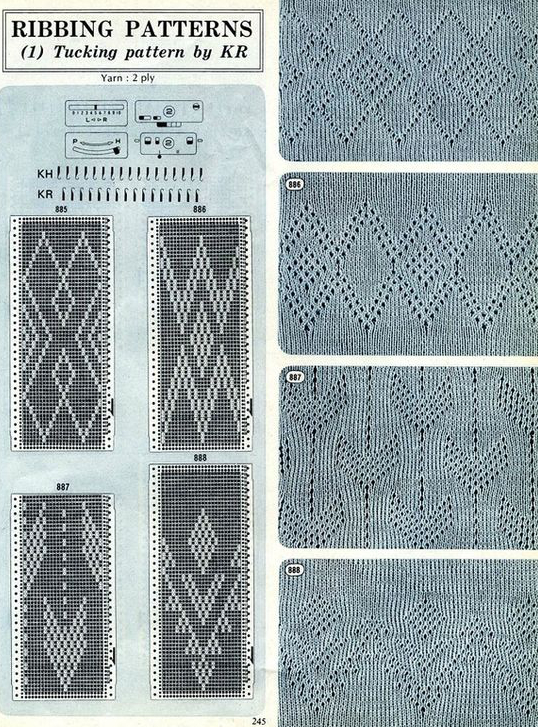 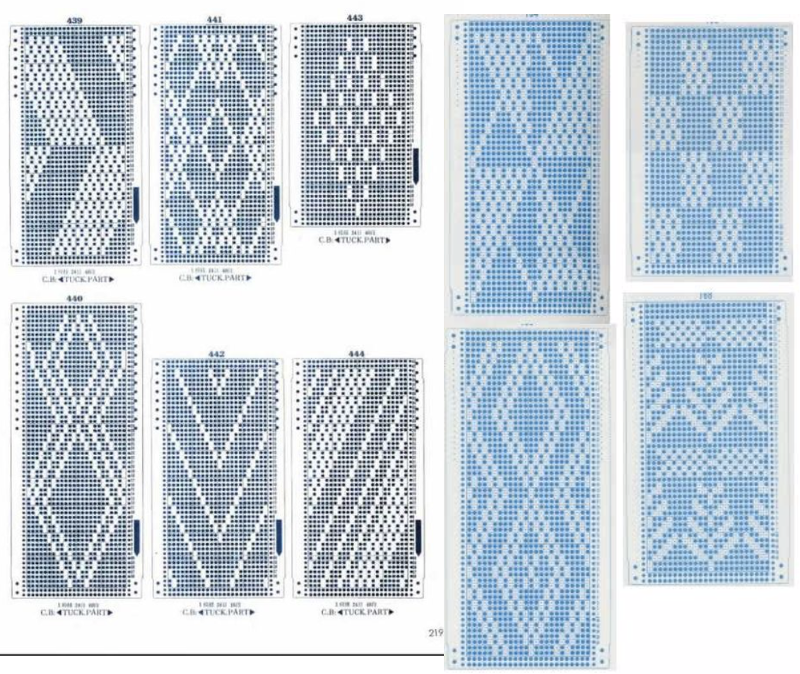 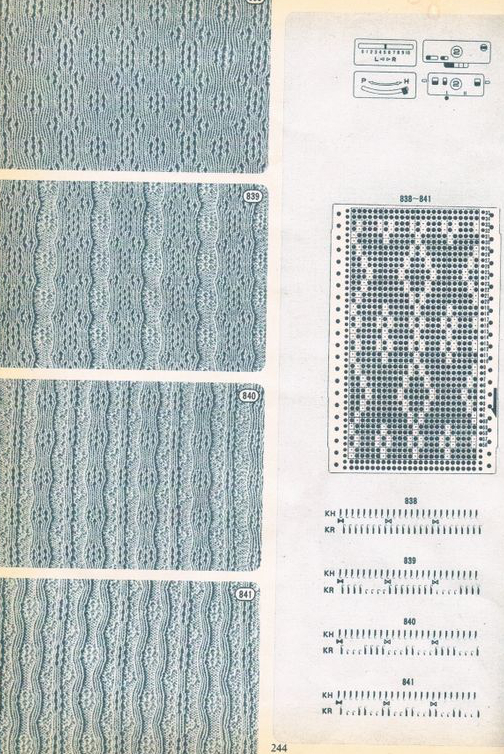 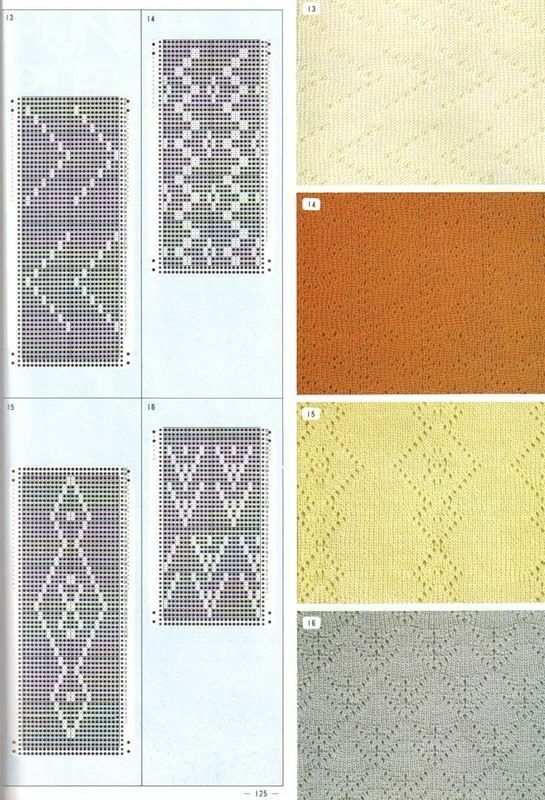 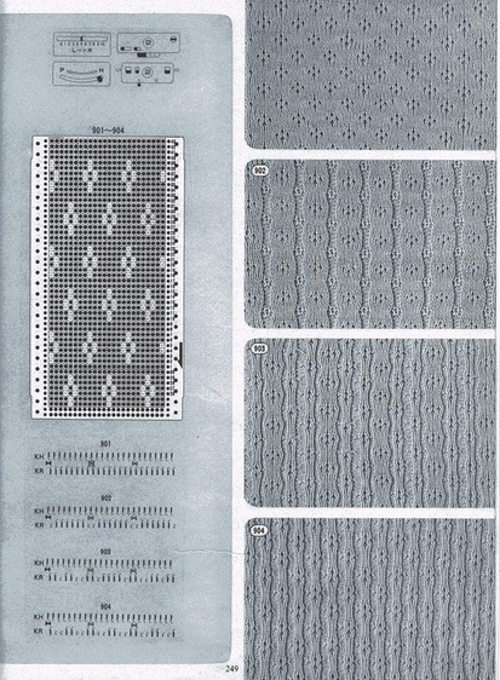 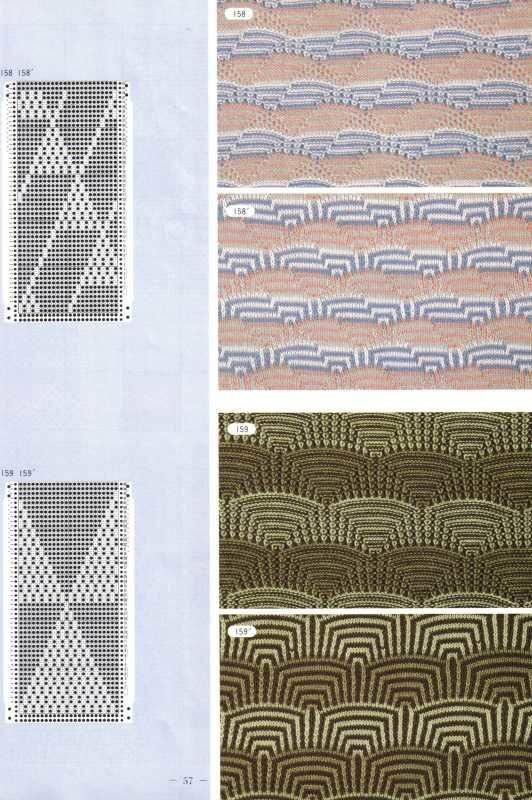 My recent posts reminded me of a repeat from an older Brother punchcard pattern book that combined lace transfers and fisherman rib. 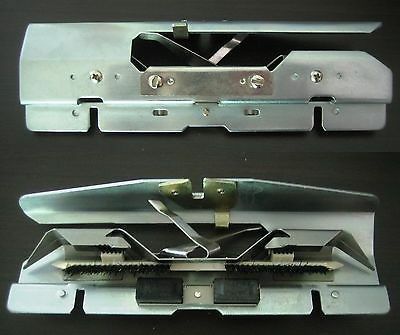 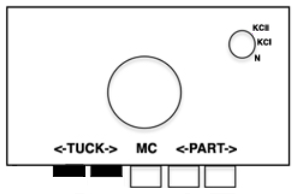 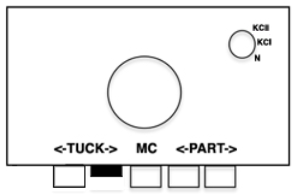 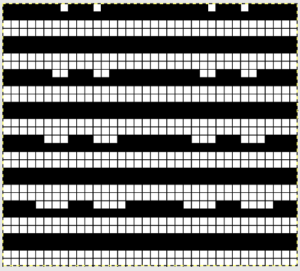 The original repeat is shown on the left, designed for use on punchcard machines. 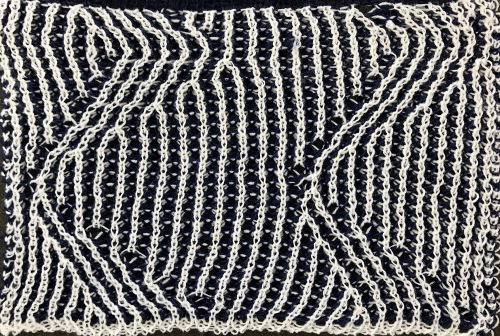 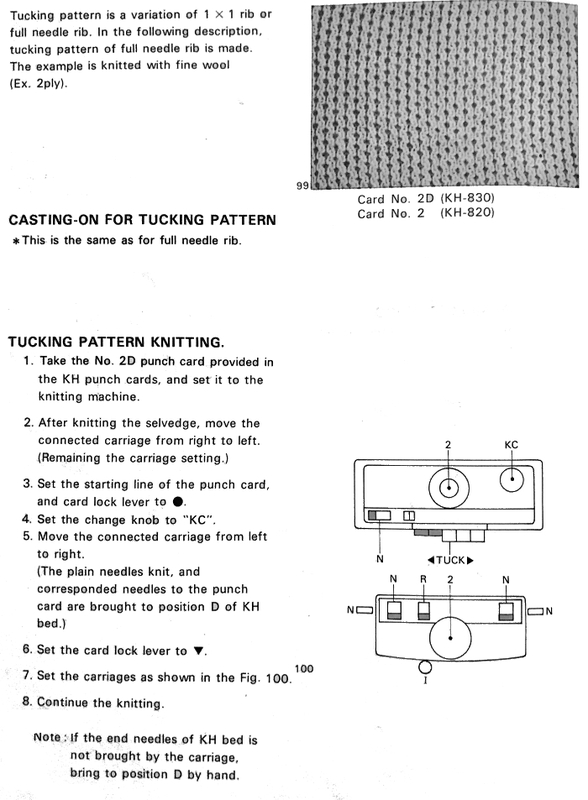 Stitch and tuck loop combination transfers are made every 4 rows, prior to knitting that row in the opposite direction. 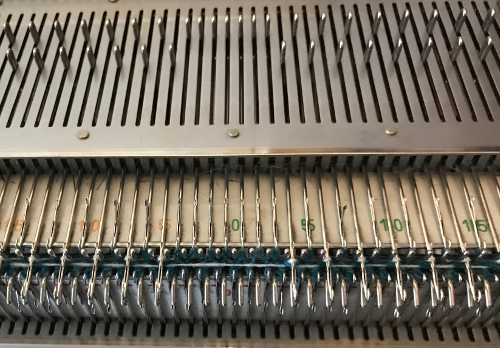 The machine is set for half fisherman rib. 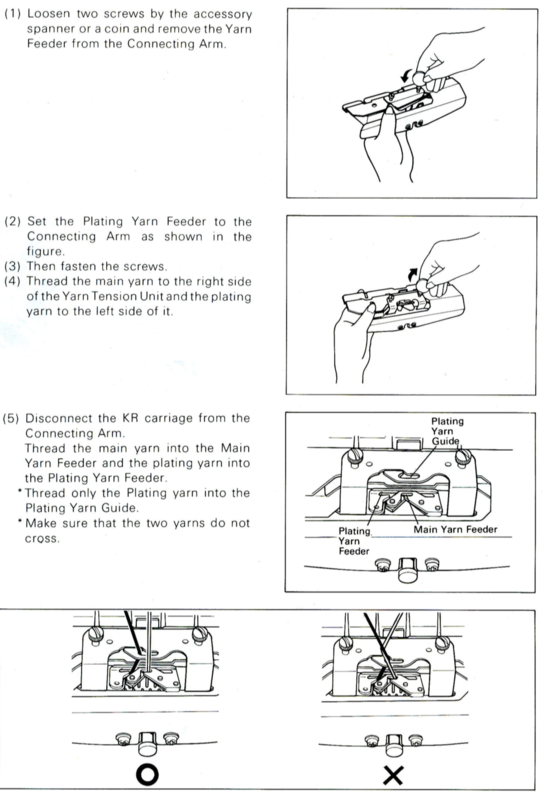 Tucking happens on top bed on all needles in one direction only, the ribber remains set to knit both ways throughout. 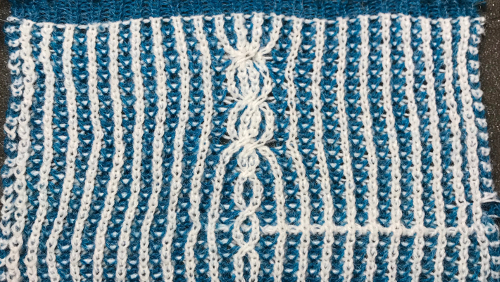 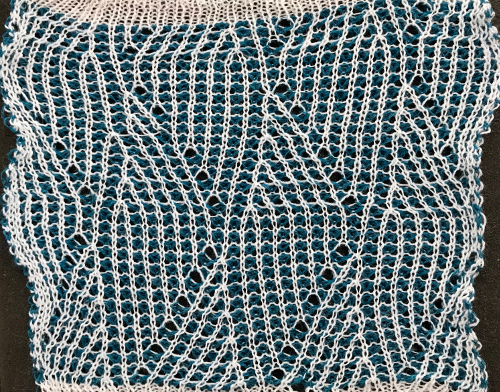 If all transfers originate on the same spot, a vertical line of eyelets is produced Can plaiting give me 2 colors the “easy” way? 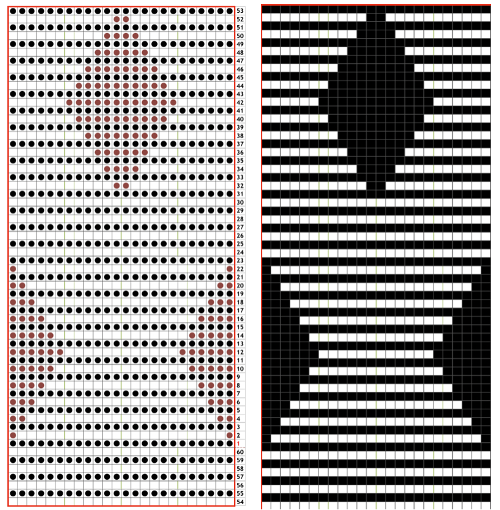 If transfers move to the right or the left, an arc will be created Aiming for the punchcard pattern book inspiration I began at first by marking up the needle tape with water soluble pen to help track repeat segments After a short trial swatch I sought to automate needle selection to serve as a guide for moving stitches across the needle bed The main bed is set to tuck in both directions. 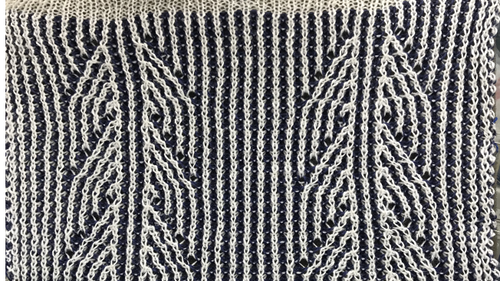 White cells tuck, black cells knit. 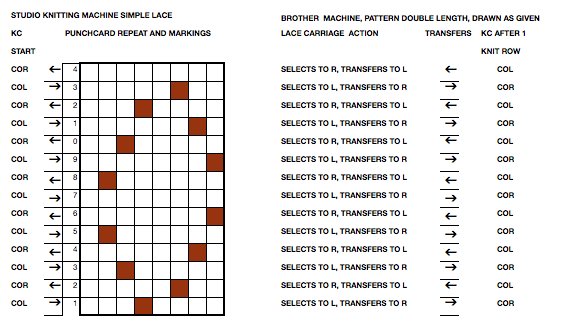 Rows in Brother preselect for the next row with each pass of the carriage, so on even number design rows as the carriage moves to the opposite side, all needles will form tuck loops on the main bed. 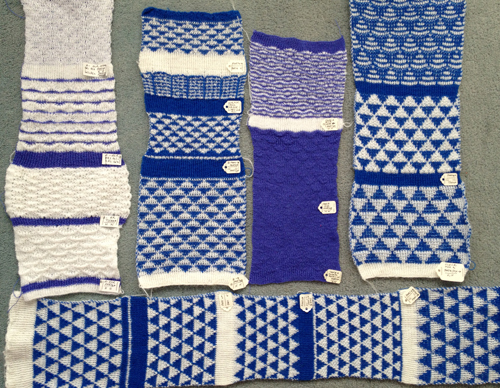 The next row will be preselected, with some needles now back in B rather than D position. 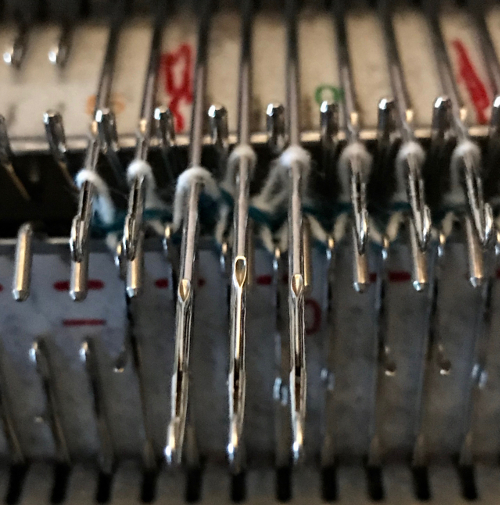 With an appropriate transfer tool, move the stitches on the non selected needles to the adjacent selected needle to their right after pushing it back to B position. 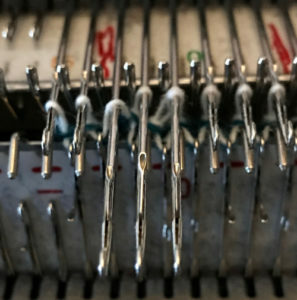 After each transfer push all worked needles and their stitches as well as he now empty needle to E position. 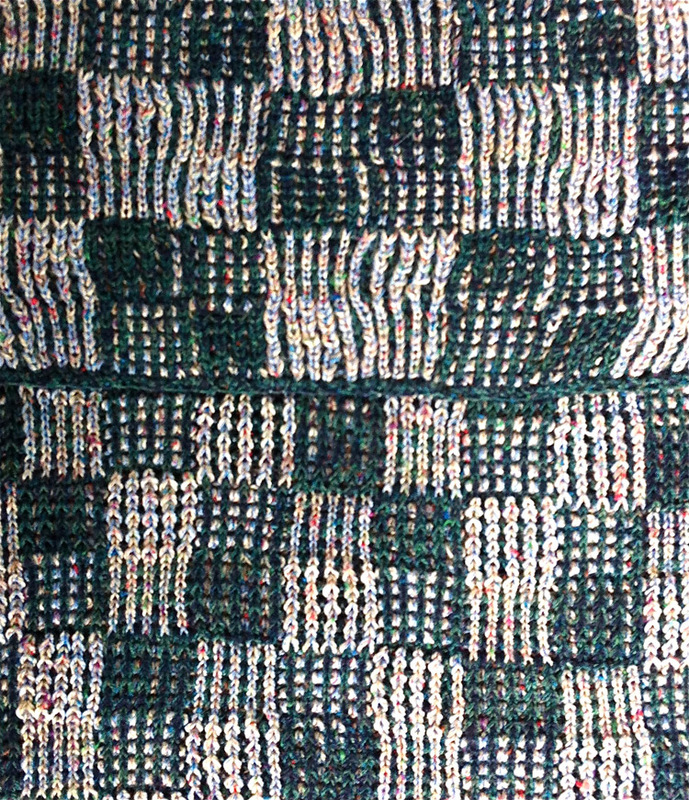 As the carriage returns to the opposite side an all knit row will be completed. 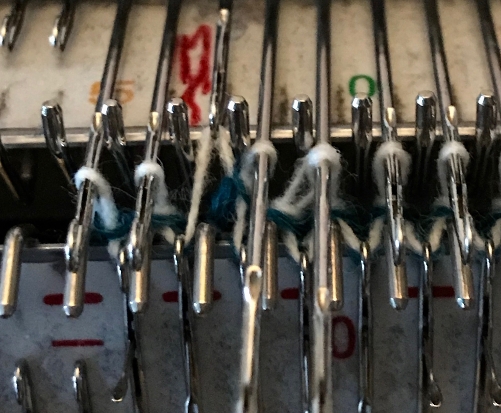 Several tension adjustments may be needed to insure loops do not get hung up on gate pegs as stitches move across the bed, while still being loose enough to knit off properly. 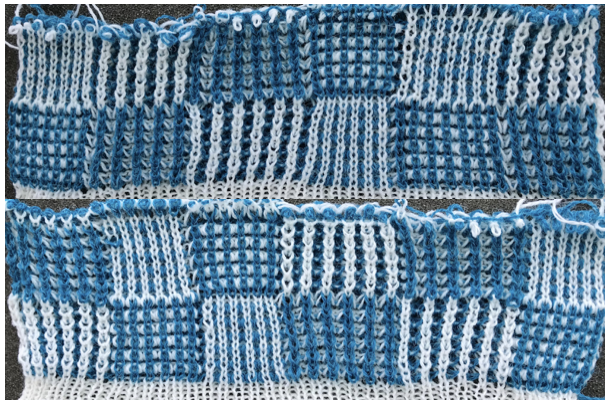 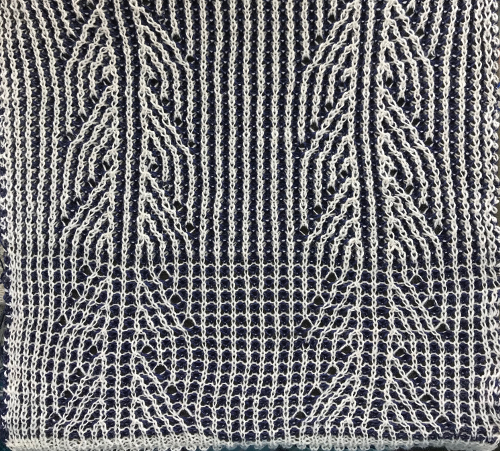 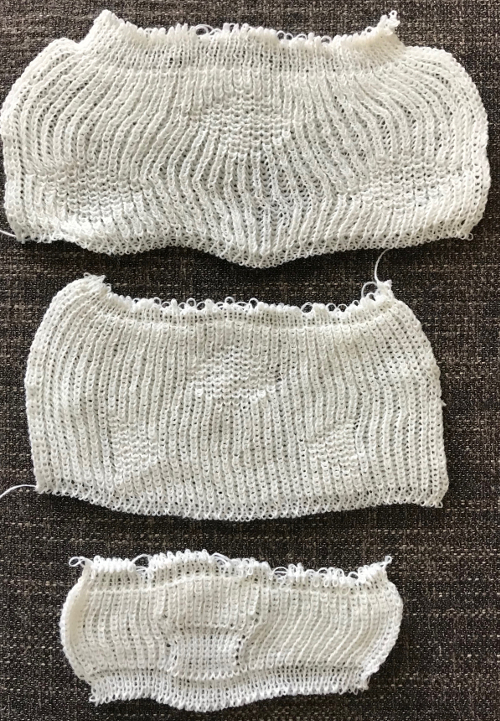 When the main bed tucks in both directions with one color, knits in both directions with the other: I did try to eliminate those lace holes. 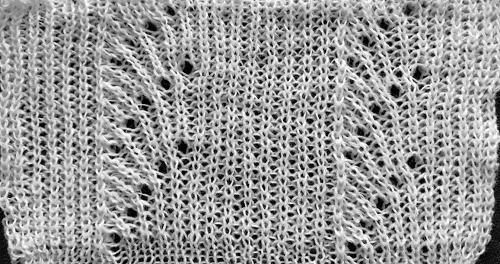 On the right of the swatch as shown below I threaded a needle and attempted to close the eyelets with stitches, getting closer to the line one might get in a hand knit. 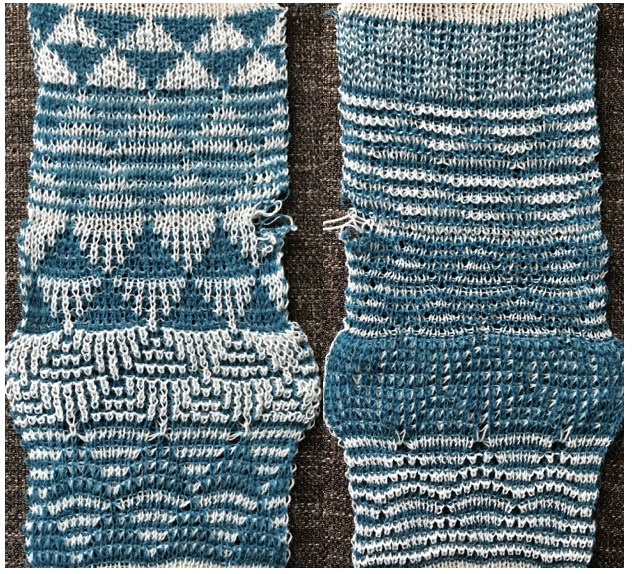 On the left I hooked up loops to fill the empty needles. 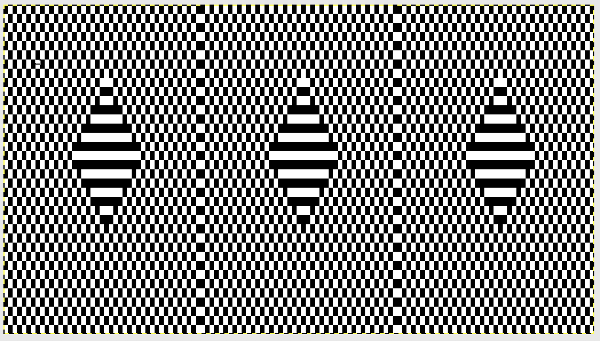 The latter changes the intersecting lines completely. 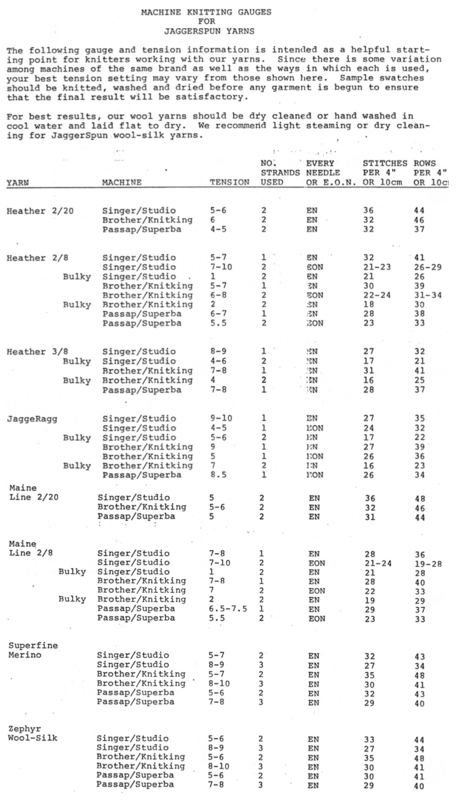 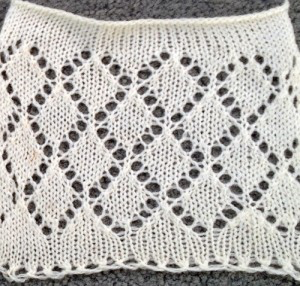 A previous post on yarns info included these guidelines provided for knitting using Jaggerspun yarns. 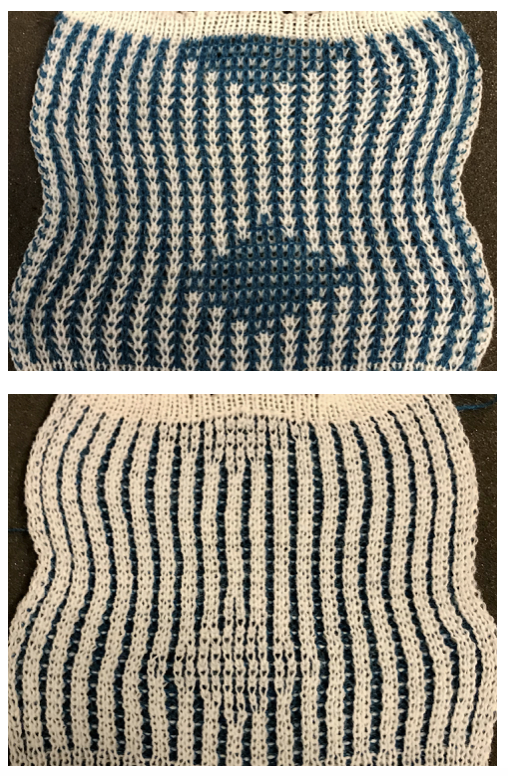 I have no affiliation with the company. 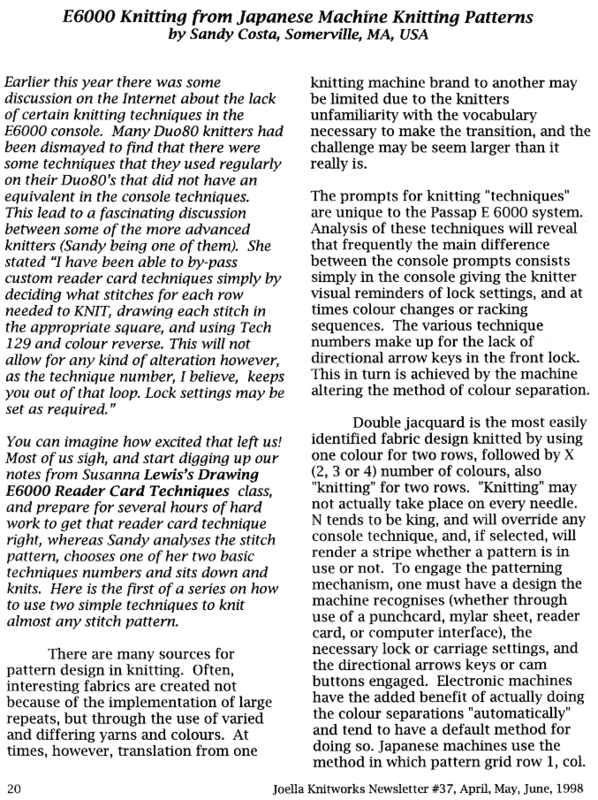 I do still continue to use some of their “lines”, and have a great appreciation for all their yarns. 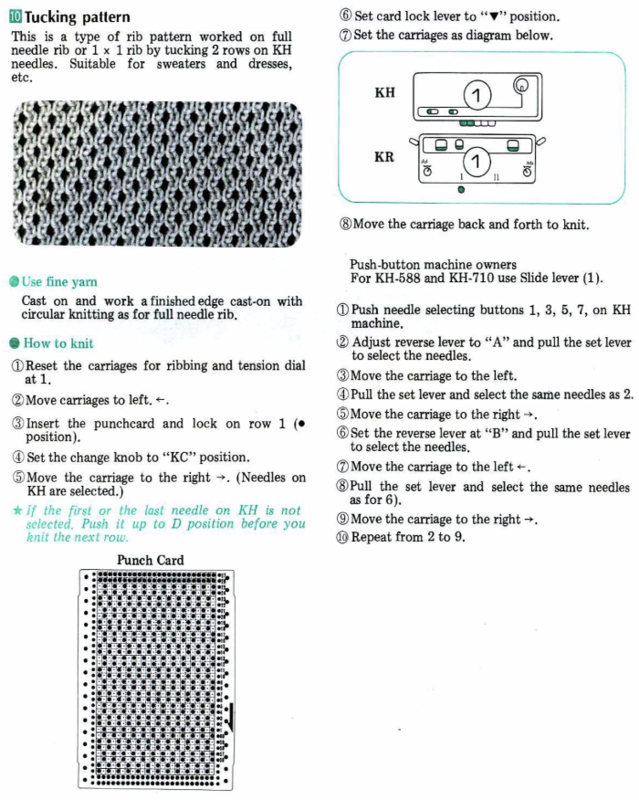 I obtained permission from the company to share content. 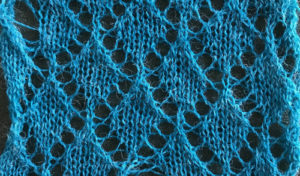 The bottom 2 yarns, superfine merino and zephyr wool silk are both 2/18. Early translations from the Japanese or German manuals did not always communicate clearly the meaning of symbols or actions required to be taken by the knitter. 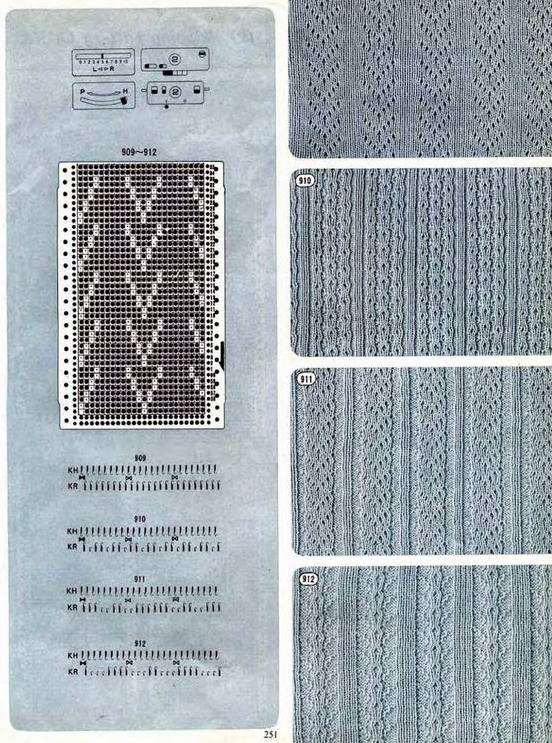 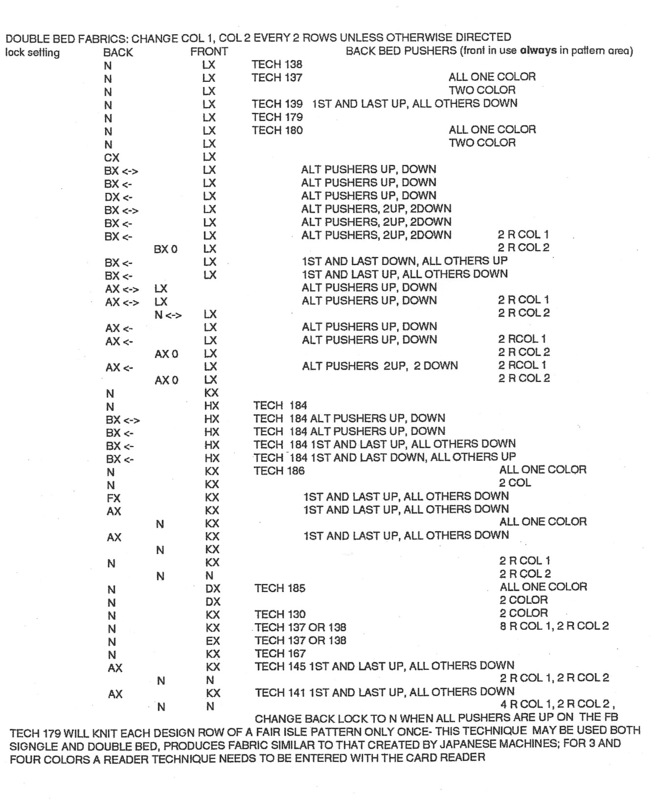 A bit clearer meaning may be gleaned from these instructions in Brother Punchcard Pattern Volume 5. 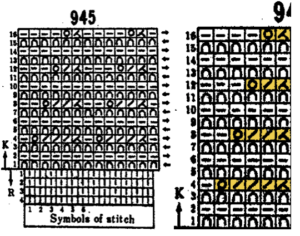 The hatch marks on the racking symbol indicate the number of pitches the ribber is moved in either direction. 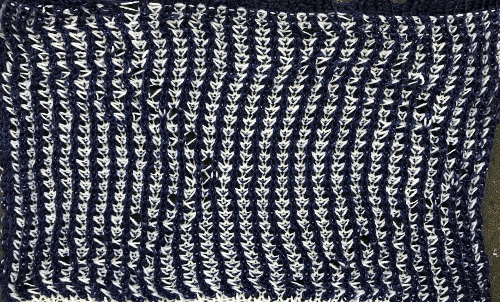 The number of stitches moved corresponds to the number of needles in work on the ribber. 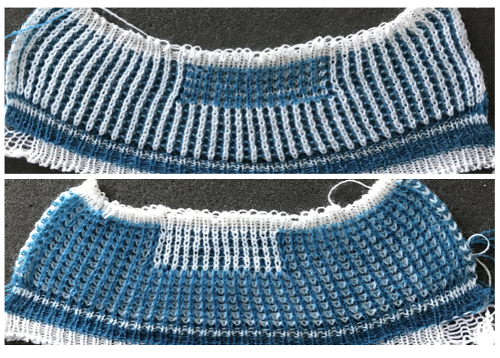 Adjustments to needle rule may be needed depending on fabric. 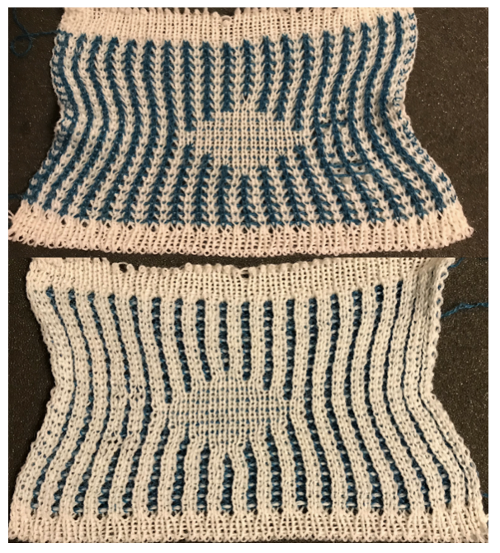 If only one bed is knitting while the other is tucking, having first and last needle in work on knitting bed. 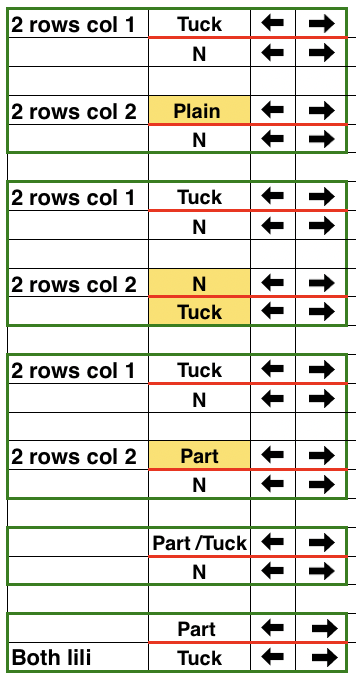 In English (aka half fisherman rib) only one (either) bed tucks. 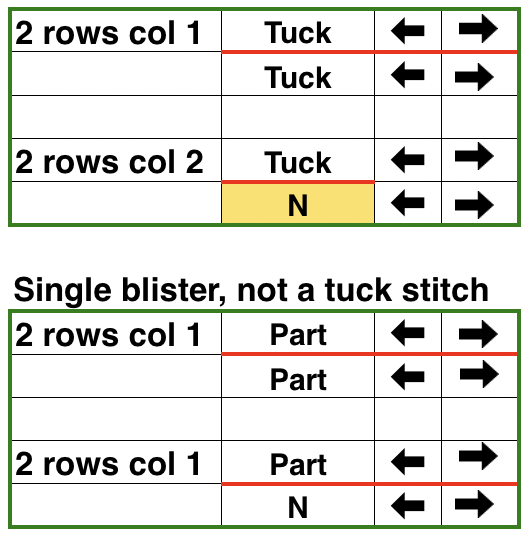 Directions marked with green #6 on left are from the Brother Ribber techniques. 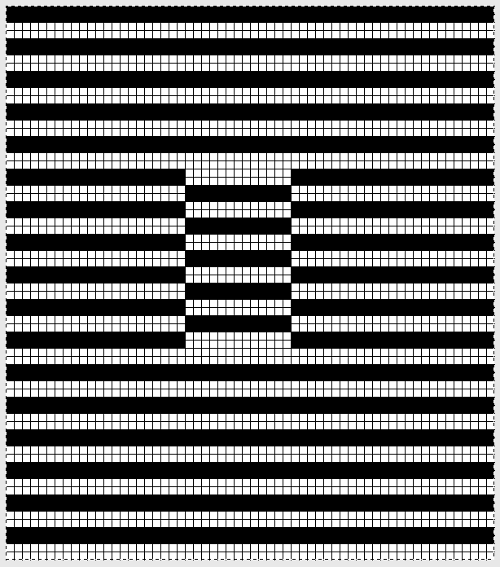 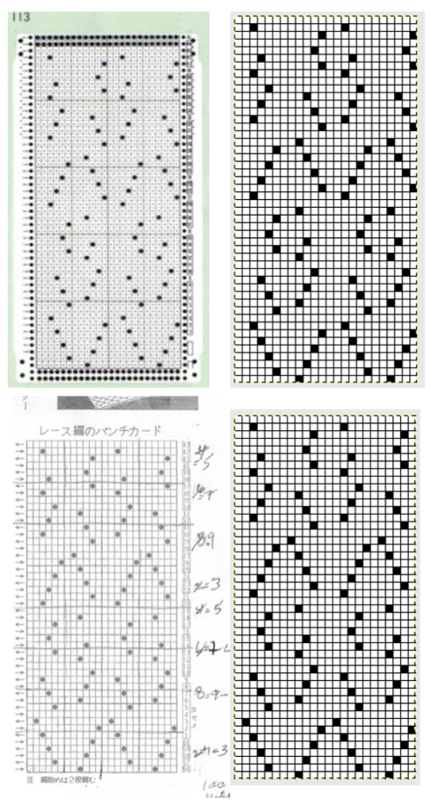 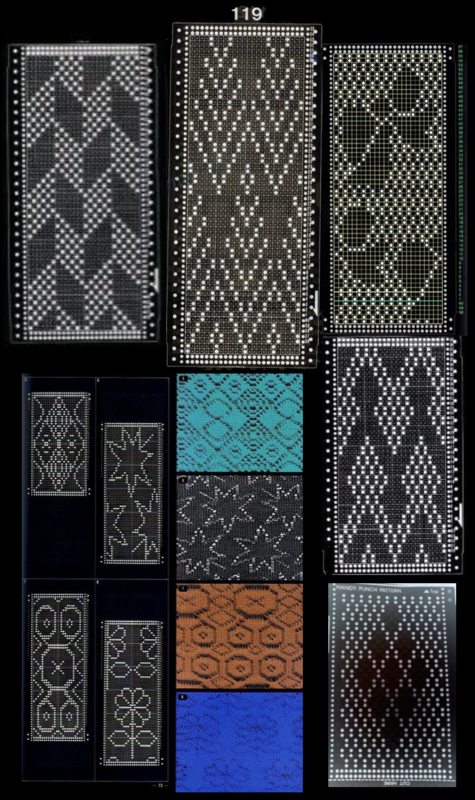 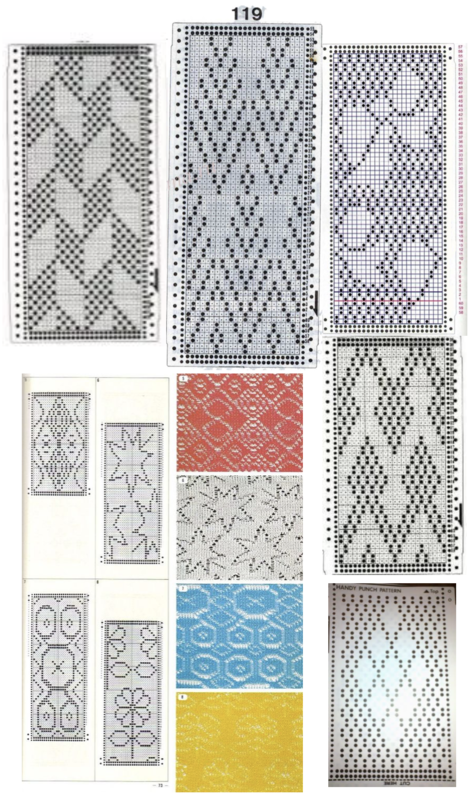 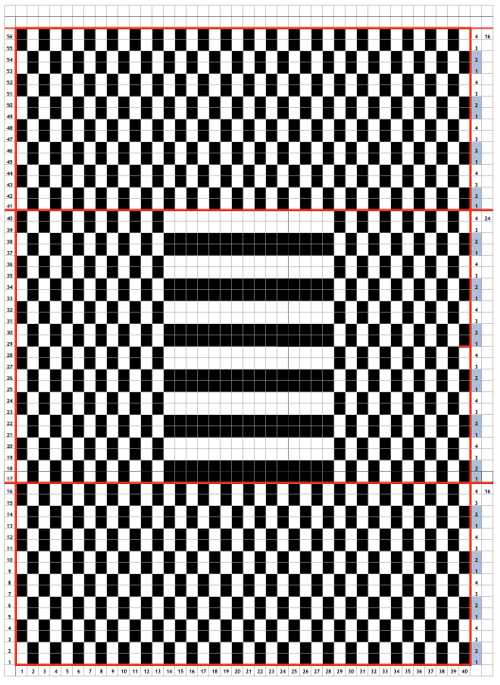 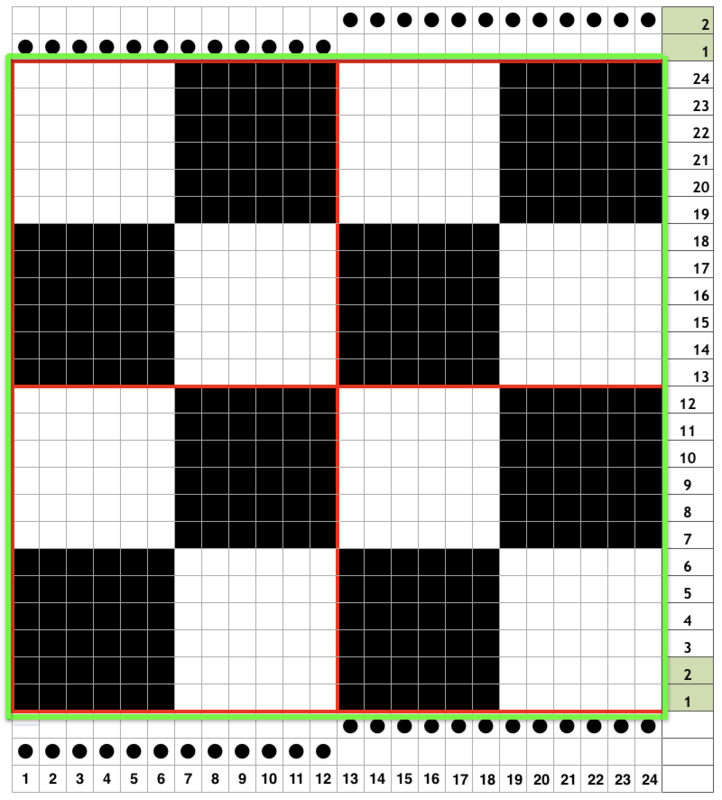 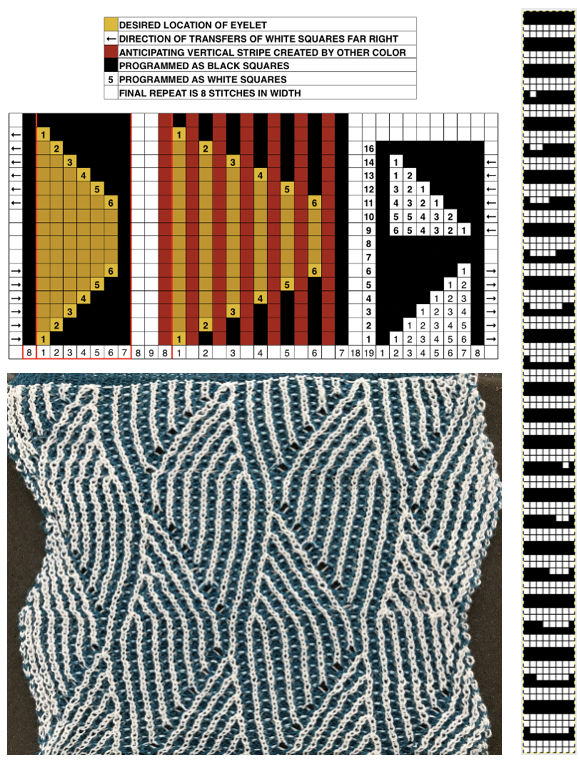 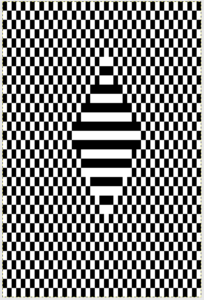 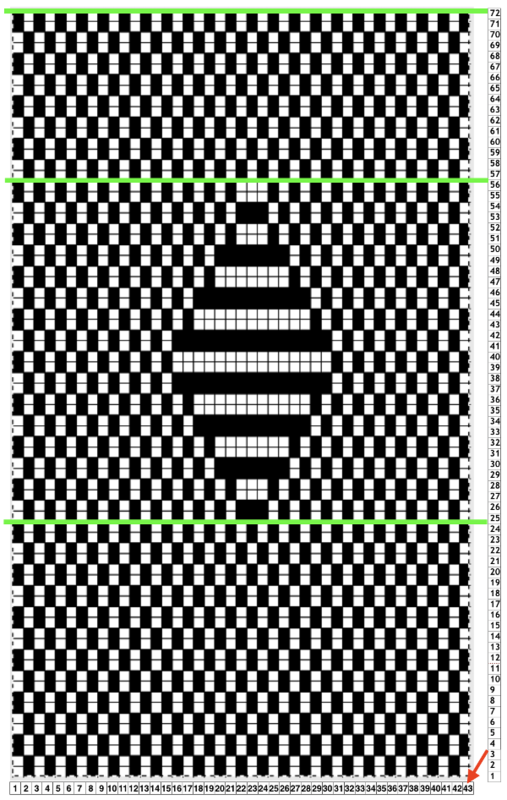 The remaining images are for single color racked checkerboard pattern from Brother Punchcard Pattern book #5. 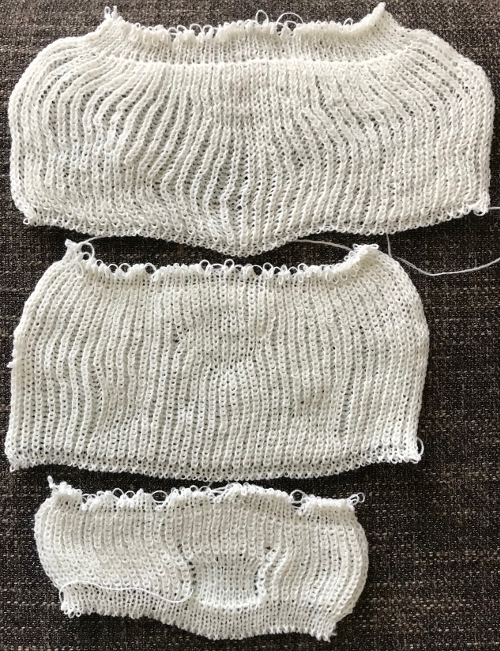 No pattern card is involved, the every other needle arrangement suggested on the right accommodates slightly thicker yarns. 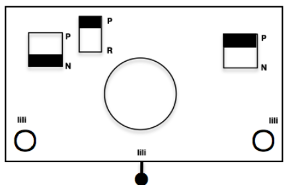 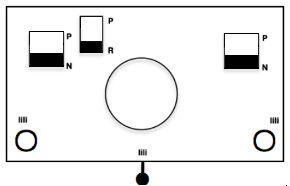 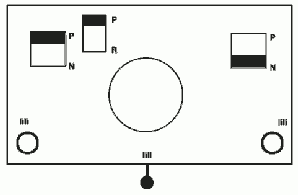 Half pitch setting is used. 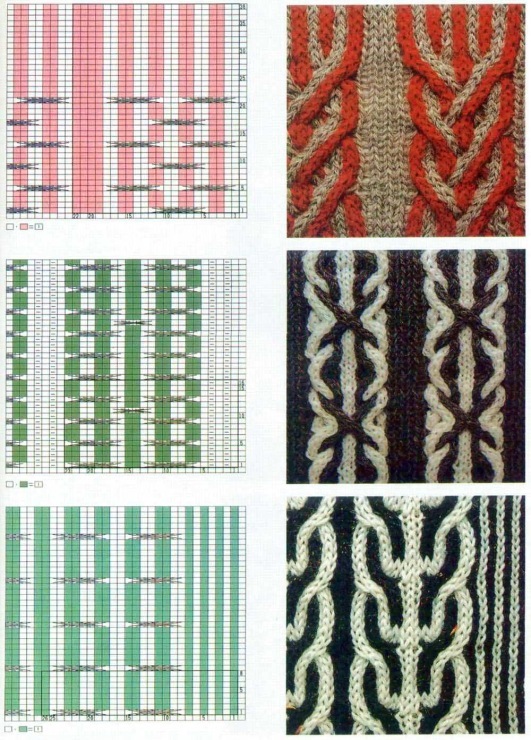 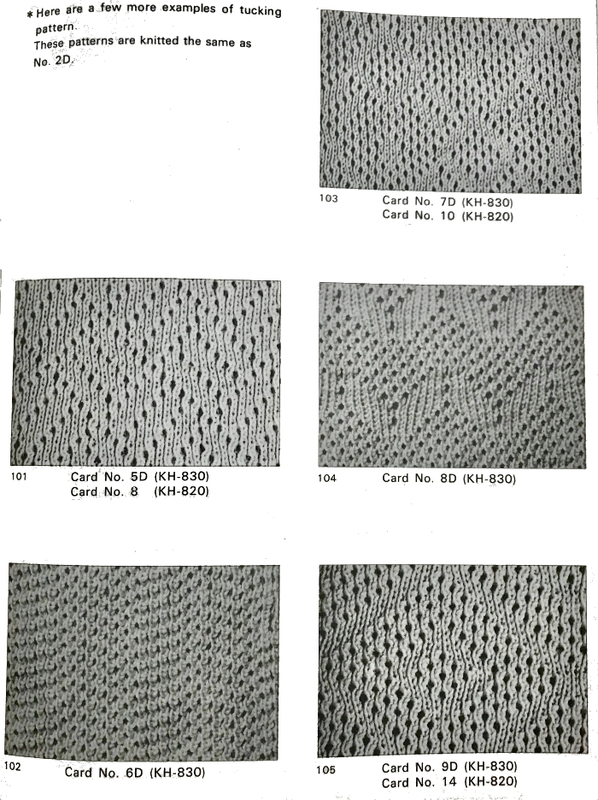 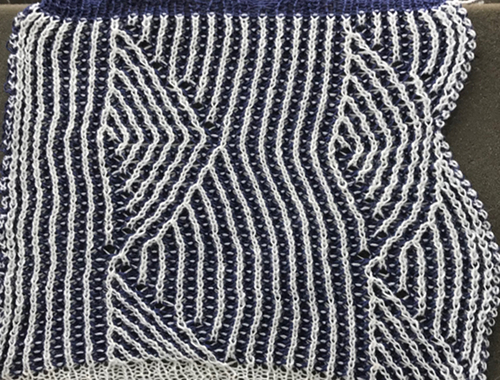 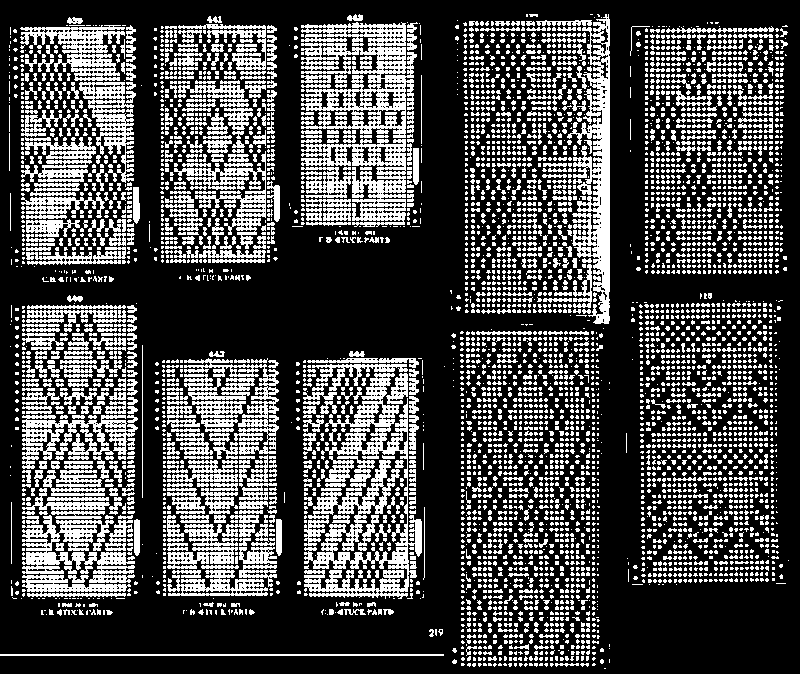 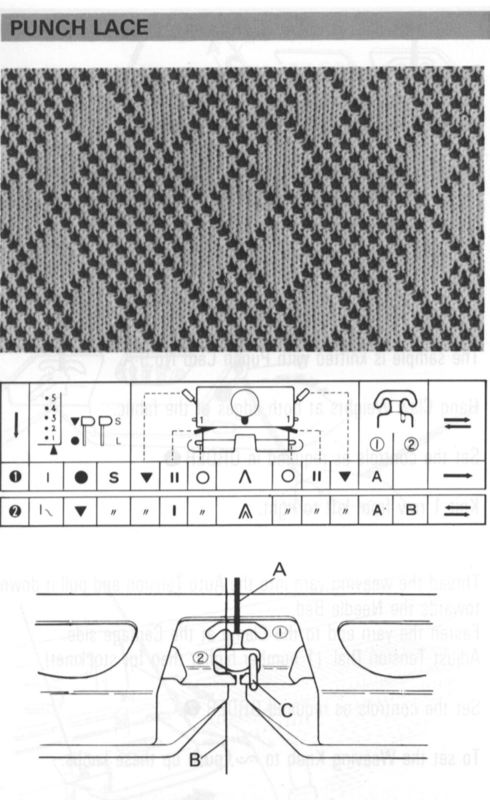 In the above instance the main bed is not performing any patterning function, it is knitting on every needle in work. 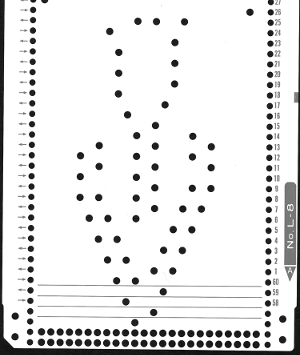 On a punchcard machine, a card may be used to track racking positions. 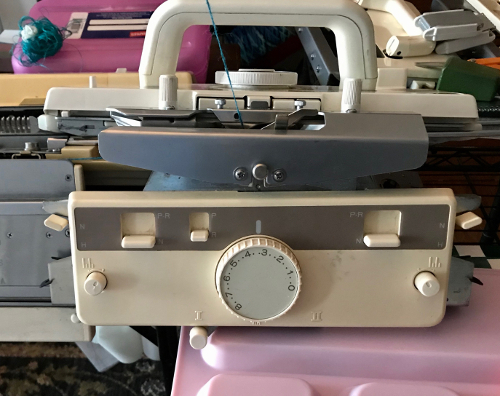 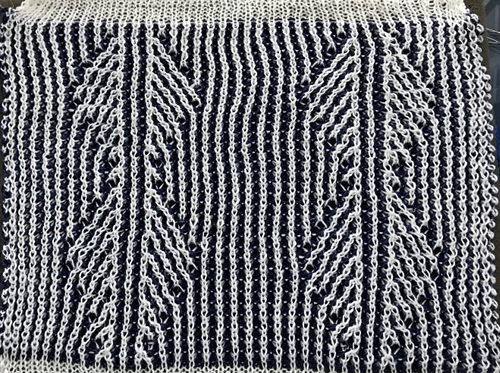 With the carriage set as usual for patterning and needle selection but with no cam buttons pushed in, the main bed will continue to knit stocking stitch. 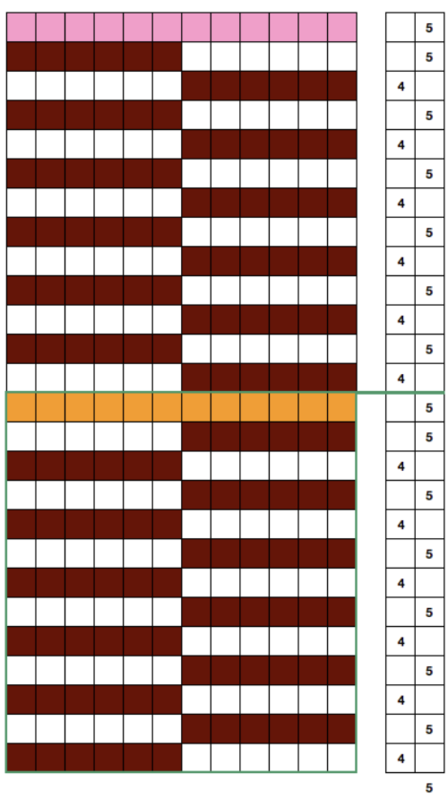 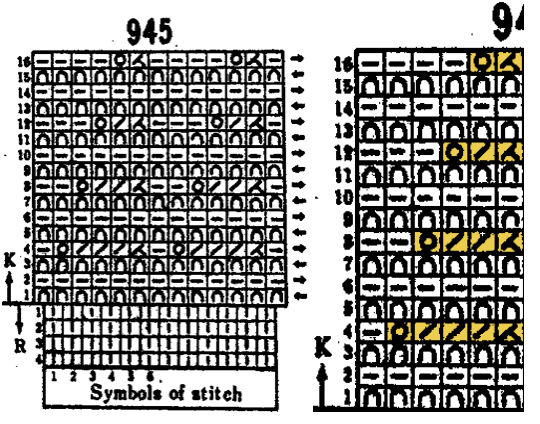 No rows are punched, and the numbers on the card in the colored columns indicate the racking position for corresponding rows. 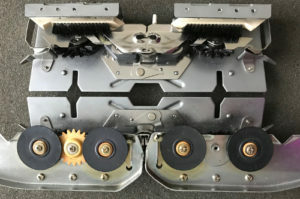 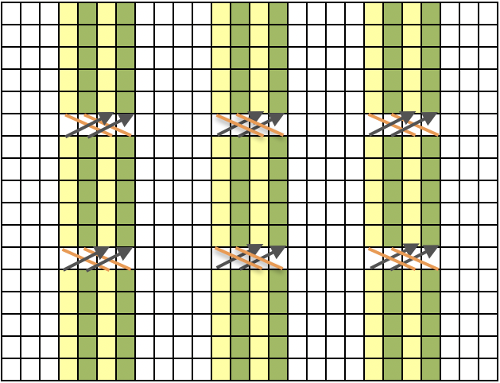 The “card” on the left is designed to match racking positions and carriage travel directions (colored arrows) to mirror those in the publications. 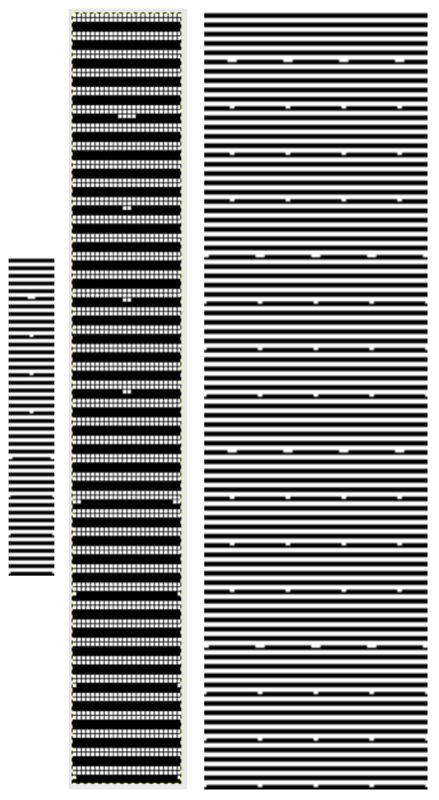 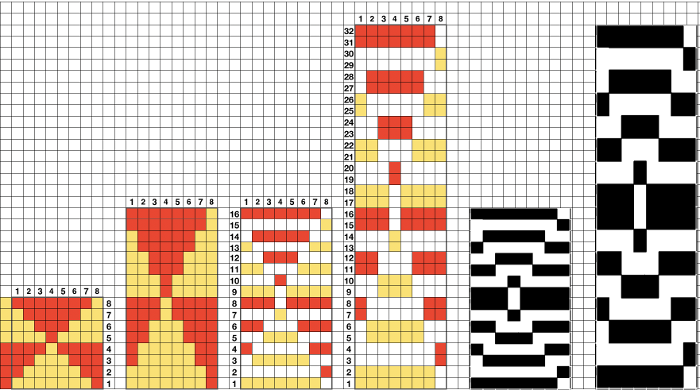 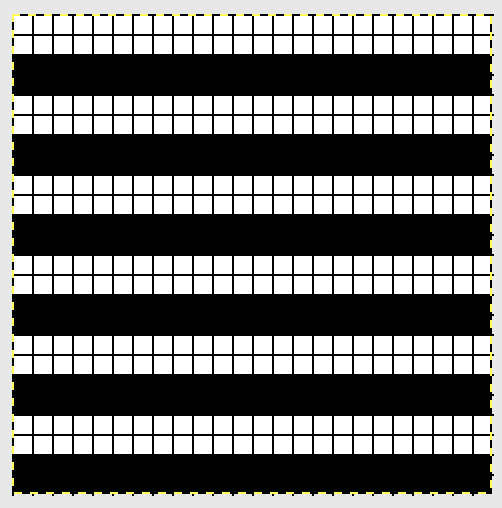 Since a 36 row minimum is recommended for continuous punchcard use, the “card” on the right has added a 4 row segment for each segment of racking directions. 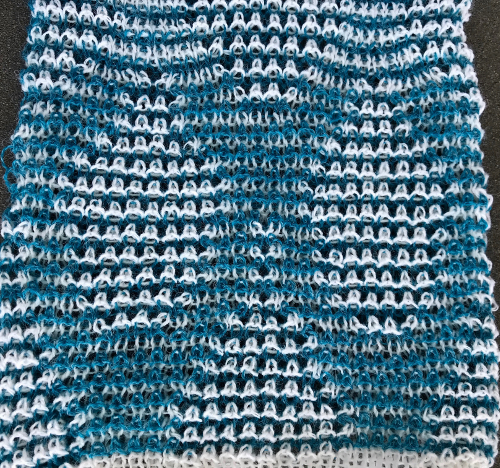 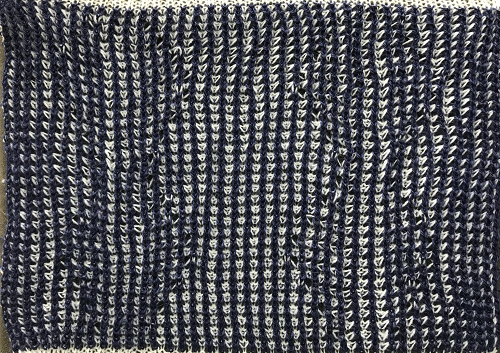 The full repeat is now 40 rows rather than 32 in height. 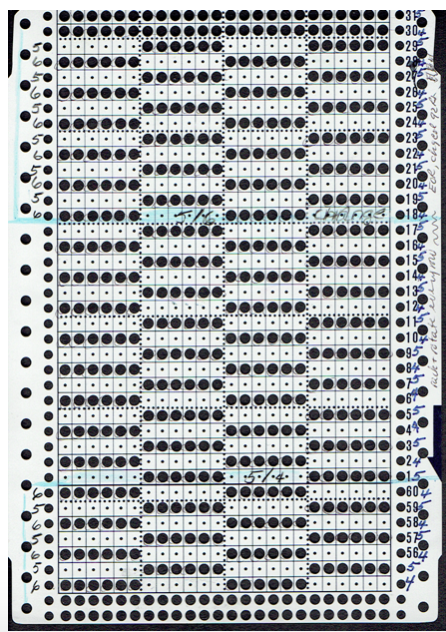 The numbered columns on the far right are as they would appear on standard blank Brother punchcards. 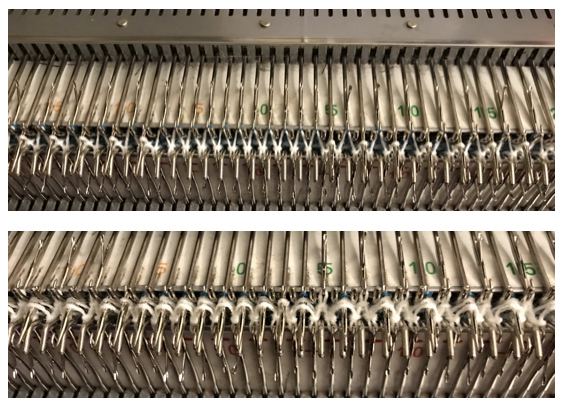 The number one is at the level of the first visible row while the card reader drum is actually selecting for the first design row. 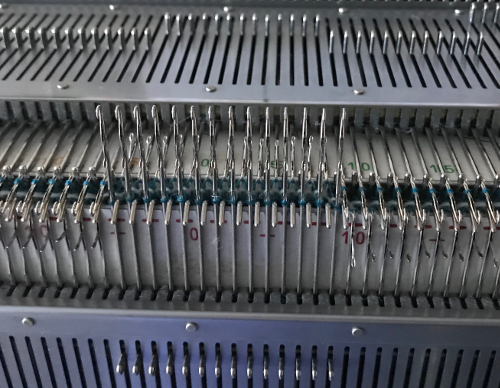 End needle selection is canceled (KCII on electronics). 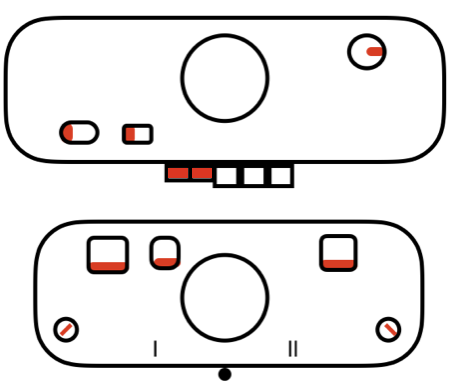 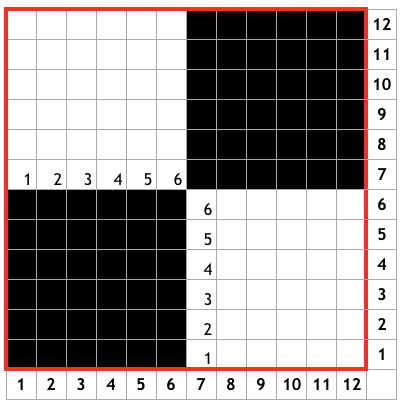 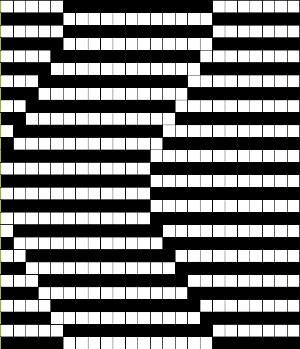 The first move as indicated by arrows is to the right, so the first row is preselected from right to left. 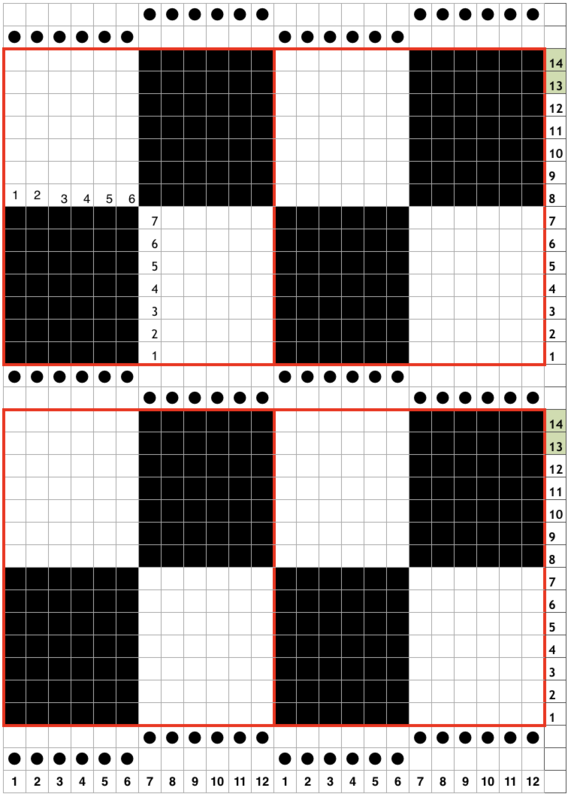 The card is then set to advance normally and released. 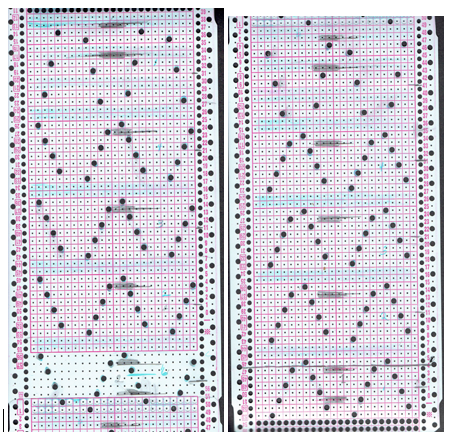 If any errors are made treat card adjustments as you would in any other fabric. 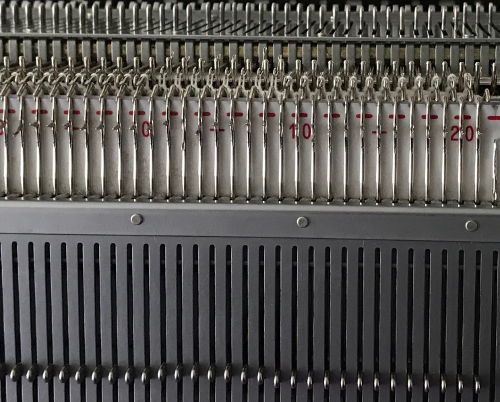 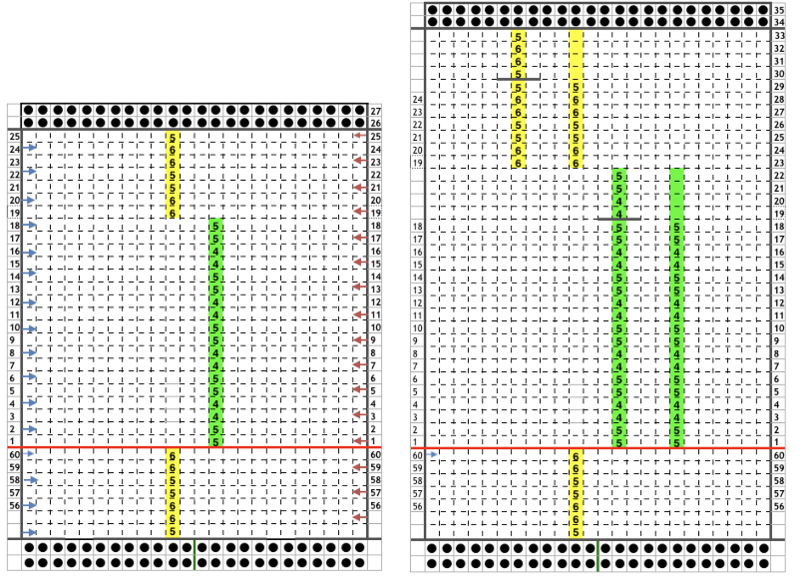 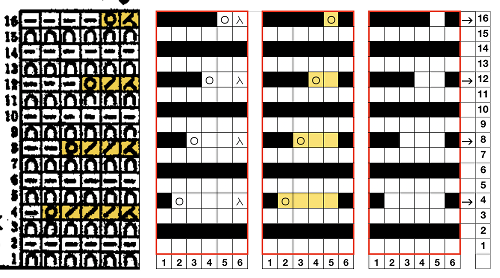 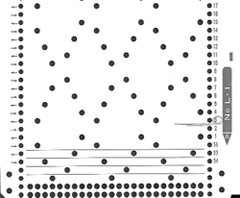 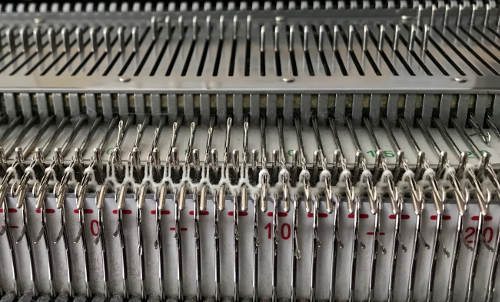 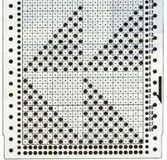 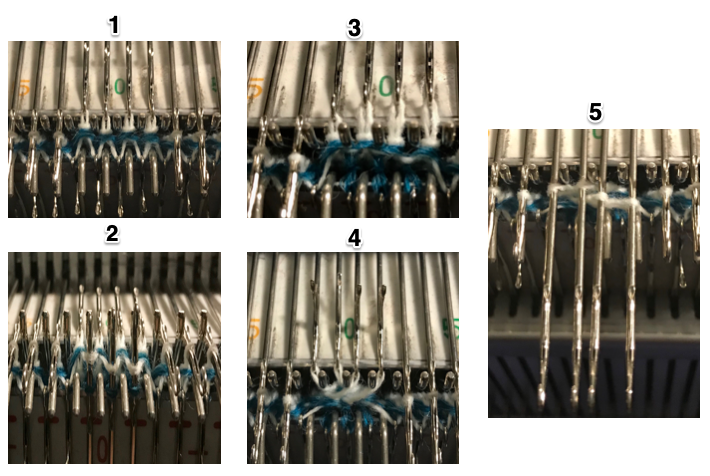 Adding main bed needle selection for selective patterning: the actual punchcard here includes annotated changes in racking sequences from 5/4 pitch positions at its start, to 5/6 racking positions for the top half of the completed repeat on its left side. 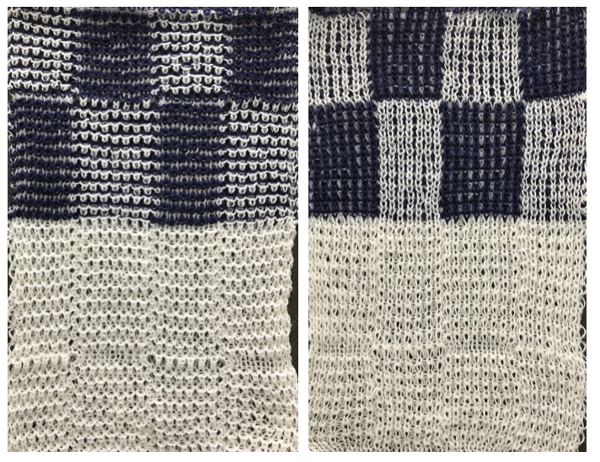 It may be used as is, or set to double length either for use with a single color, or combined with color changes every 2 rows. 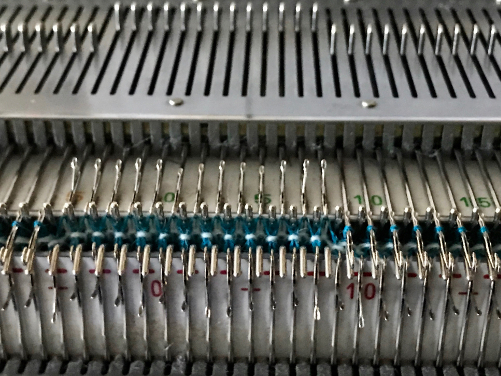 On fabrics with racking enlarge stitch size by1/2 to one full number to accommodate the stretch needed in racking the stitches. 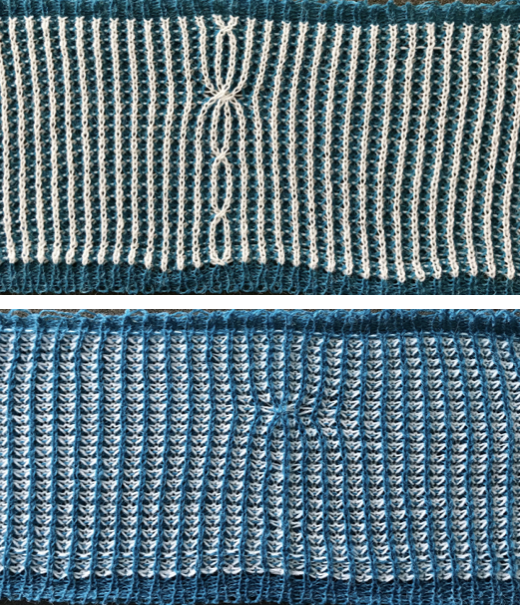 Color changes: fabrics made in full fisherman rib are reversible, while those in half fisherman are not. 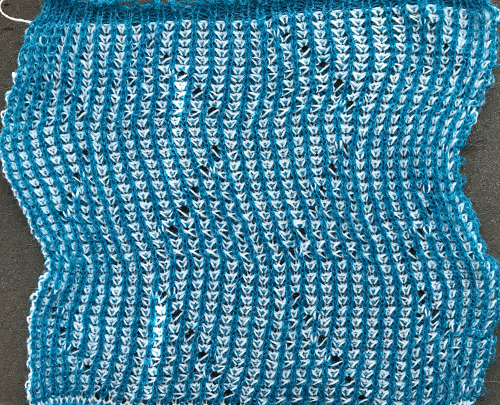 In full fisherman rib in order to knit a specific color, that color must knit for two rows, and tuck for 2 rows alternately. 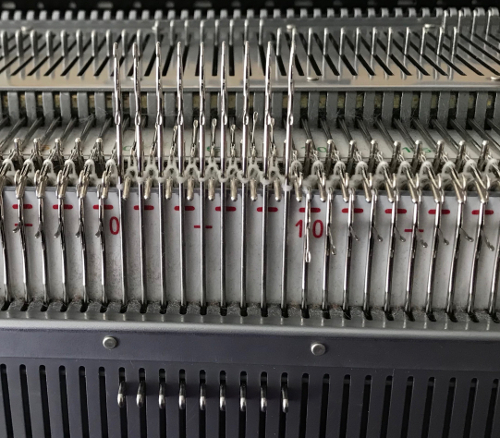 In Passap AX with pushers and arrow keys must be used, in Brother ribber needles would need to be hand selected to proper position on every row. 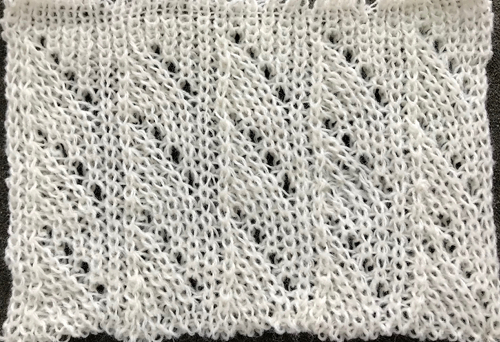 Yarns used should be soft and have some stretch. 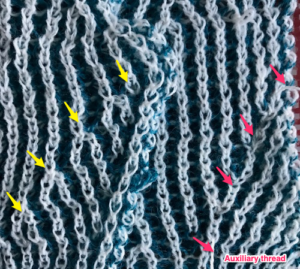 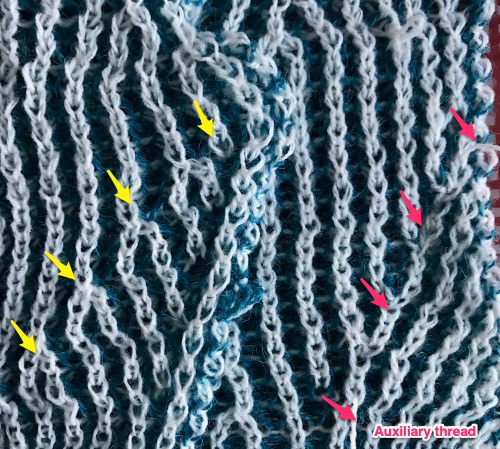 Every other needle patterning may be used with slightly thicker yarns. 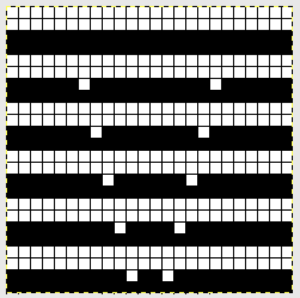 In programs or machines that allow for memos that correspond to design rows for each repeat, enter racking pitch number beginning with design row number 1, continue to 32 or more as needed. 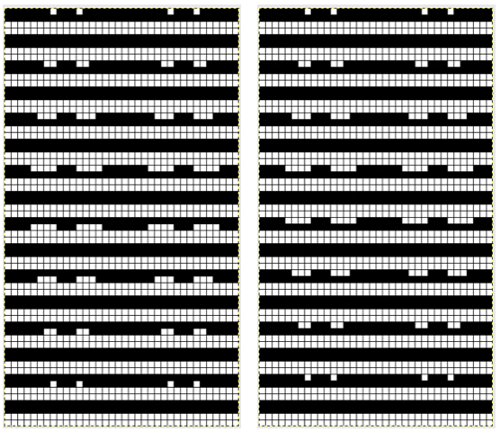 The racking sequence is changed at the halfway point of the full repeat. 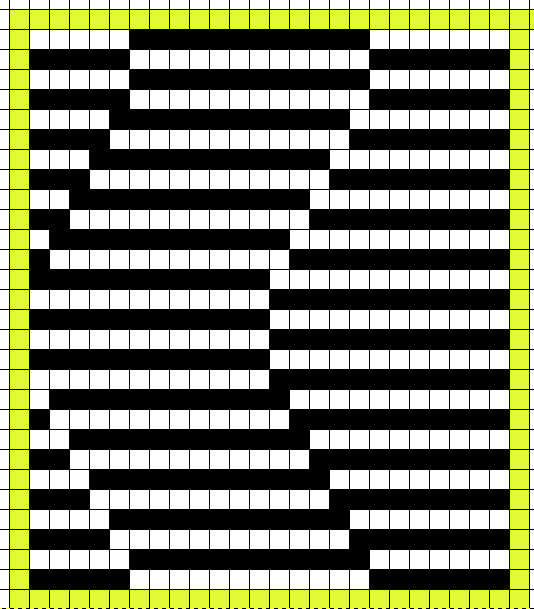 Added experiments: using the same electronic repeat above, here I worked *20 rows racking every row between positions 4 and 5. 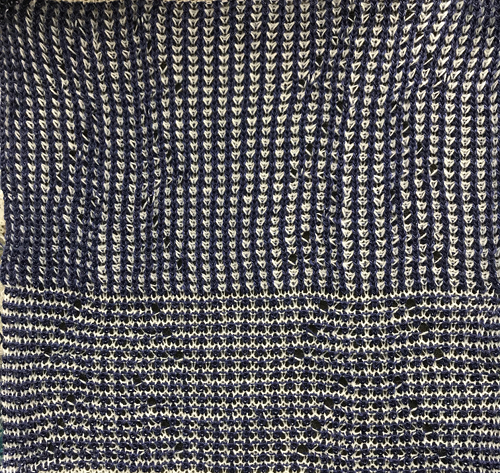 One row was then knit on all stitches on the top bed** (I pushed needles out manually rather than changing cam settings), repeated * to**. 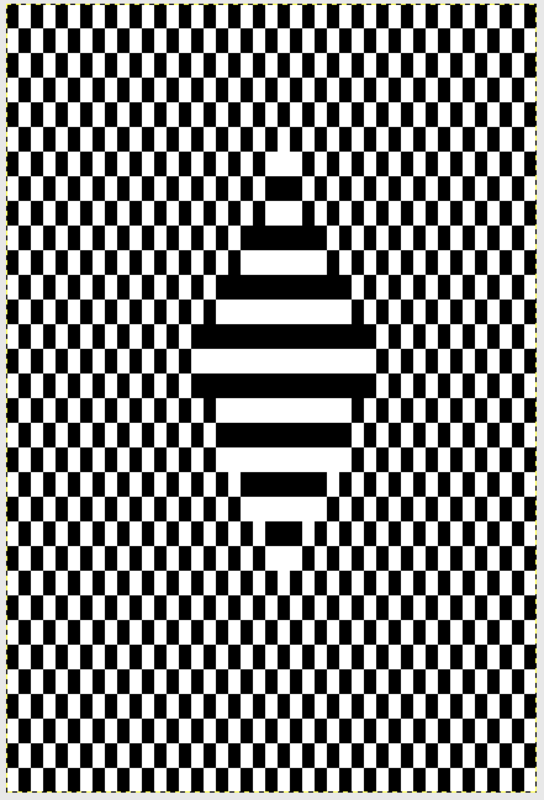 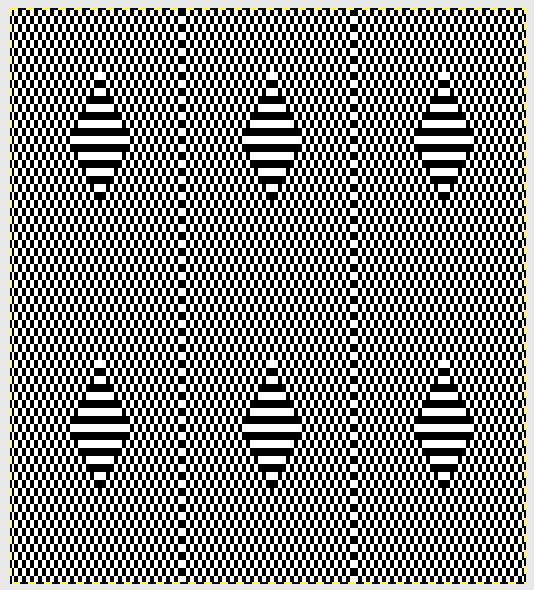 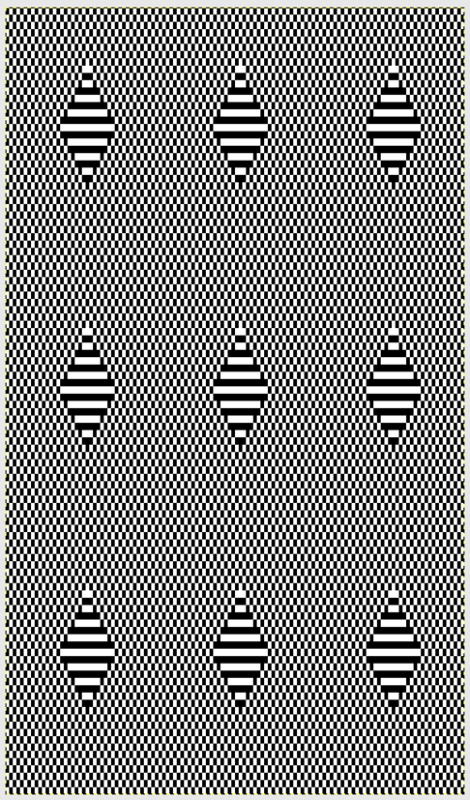 The fabric reminds me of racked herringbone, the “checkers” are distorted Changing color every 2 rows shows the same leans in fabric. 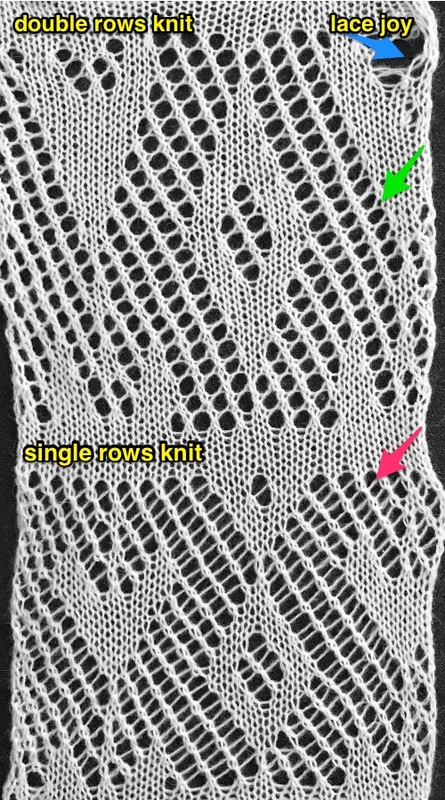 I have had intermittent problems with my ribber, stitches begin to simply not be picked up by the main bed and are dropped for no apparent reason A very different fabric is created using the repeat and instructions below *Knit 2 rows, rack 1 pitch to left; knit 2 rows, rack 1 pitch to right to RC 20 (or preferred row count); knit 1 row continuing in pattern to opposite side without racking**. 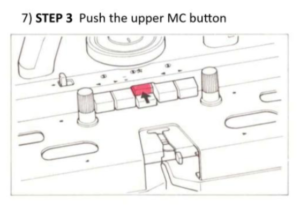 Repeat * to**. 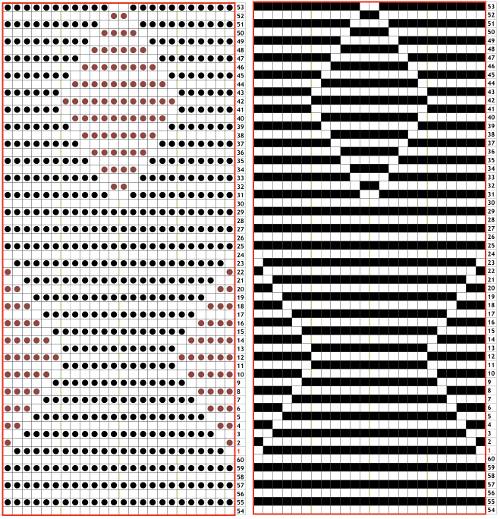 One repeat of the 2 sequences is 42 rows in height. 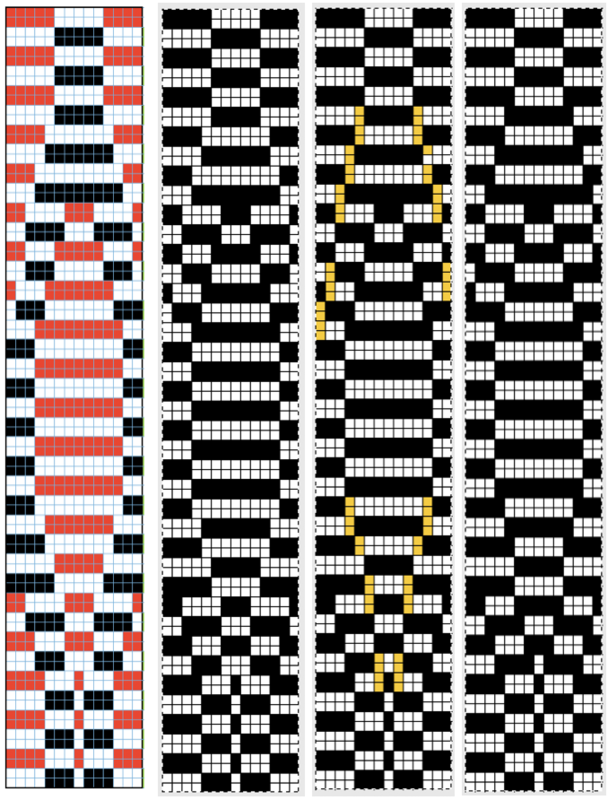 At row 1 of each new (here 21 row) sequence, the carriage starts on the opposite side Changing colors every 2 rows is possible. 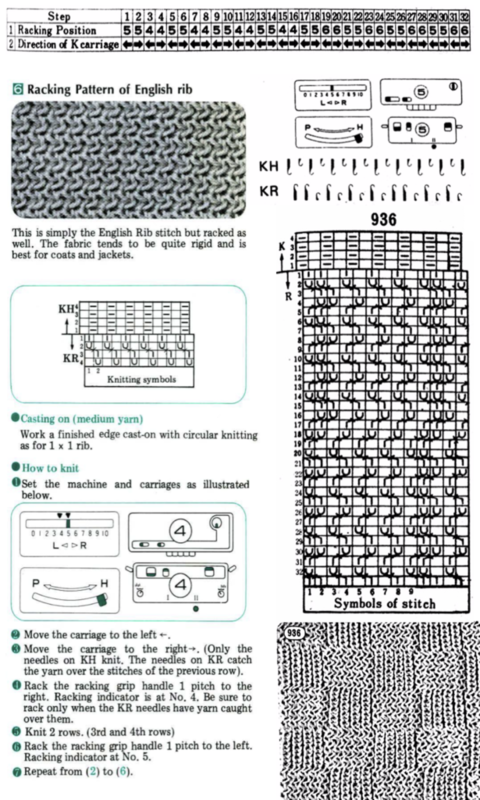 The racking will begin with the carriages on alternate sides of the machine after the single row knit without racking. 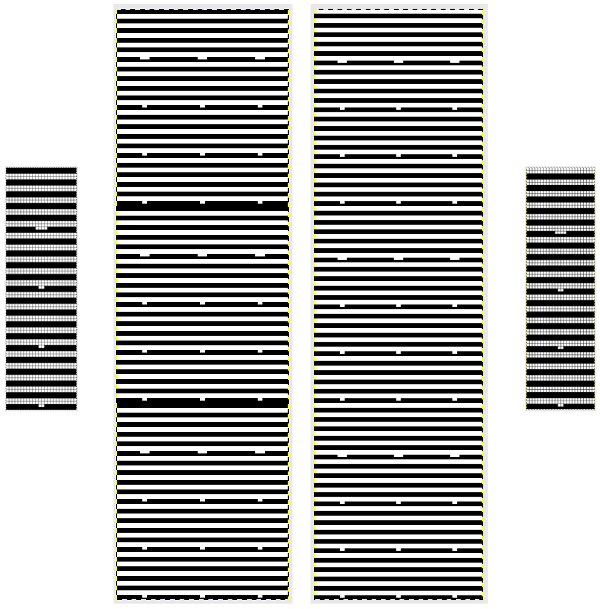 In segment 1 racking occurs on the left, color changer side, and on segment 2 racking occurs on the right, opposite the color changer. 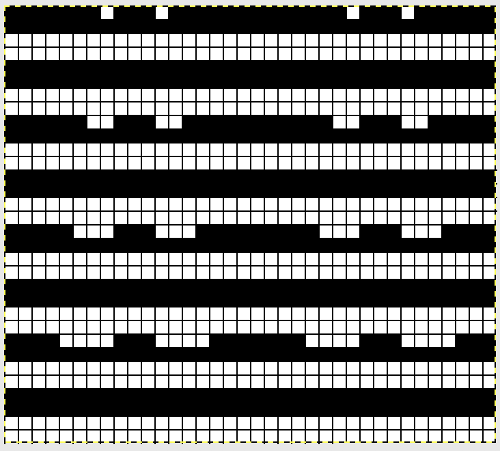 tech 129: (black square tuck for single row) on front bed. 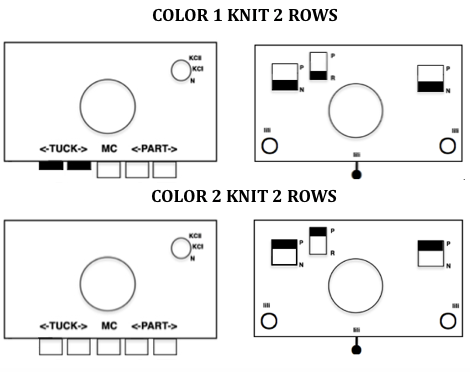 Set up back bed after prep rows, making sure pushers are the same work/rest position as on the front bed *Knit 2 rows, rack to left, knit 2 rows, rack to right to preferred row count ie RC 20; knit 1 row still in pattern, without racking**. 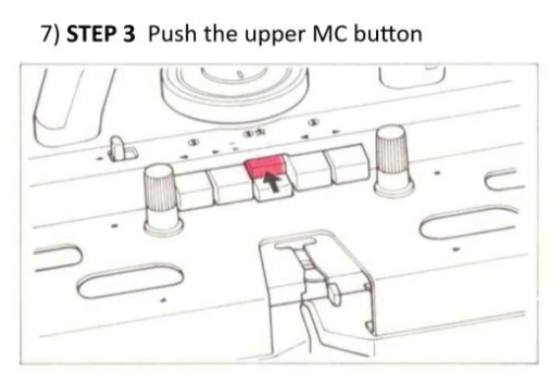 Repeat * to**. 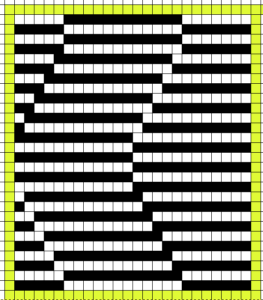 One repeat of the 2 sequences is 42 rows in height. 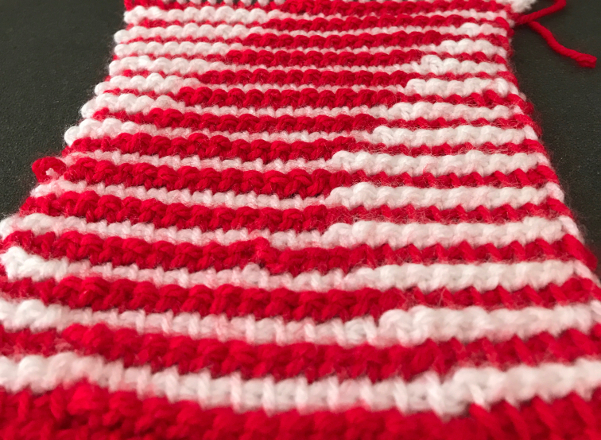 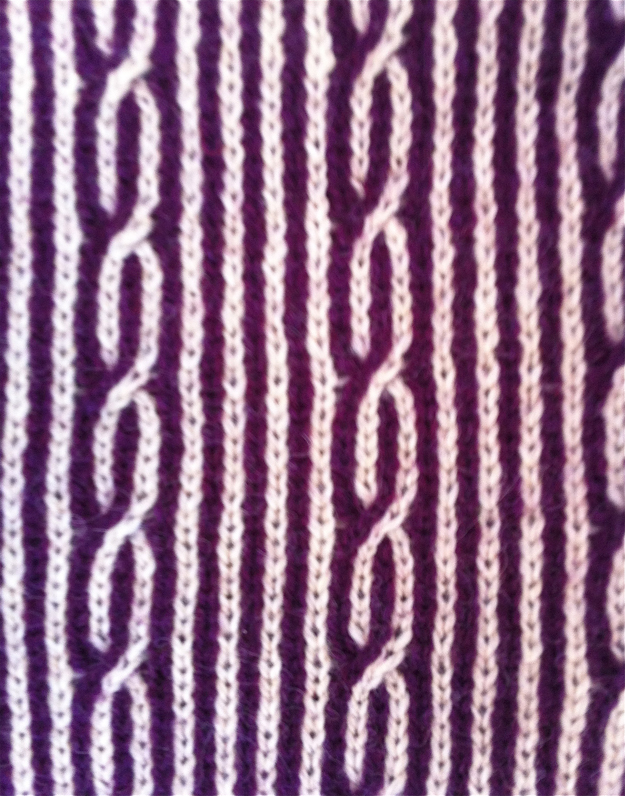 The resulting pattern is reversible.” This swatch was knit with with bottom 3 blocks using AX on back lock, N in front. 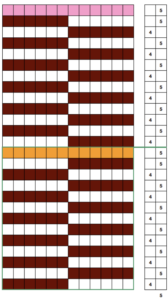 The back bed pusher set up is doing the patterning. 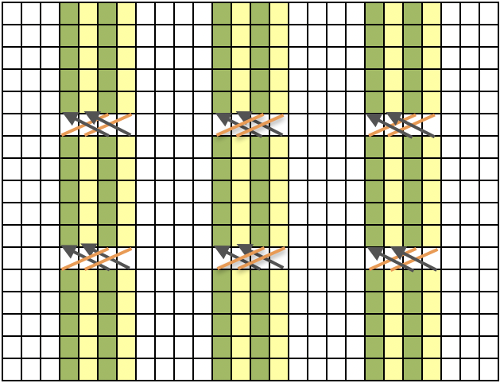 The top 3 blocks are set to pattern selection on both beds, using AX, arrow keys, and KX on front lock. 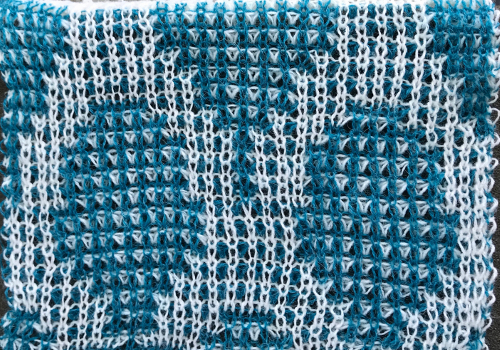 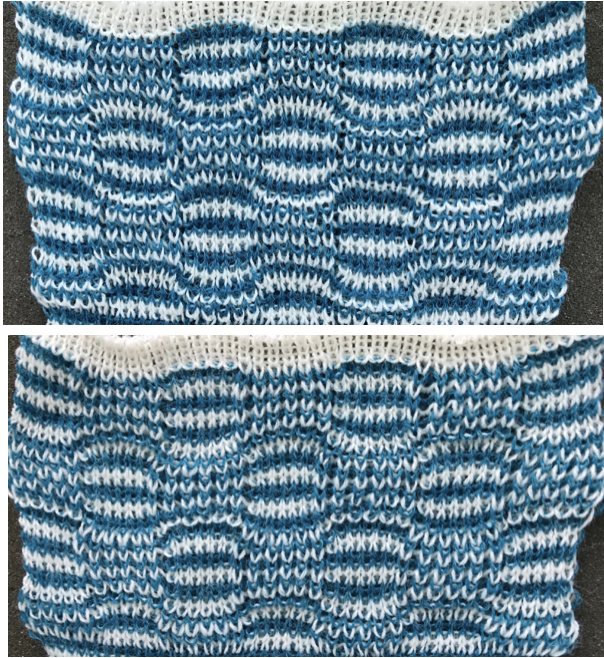 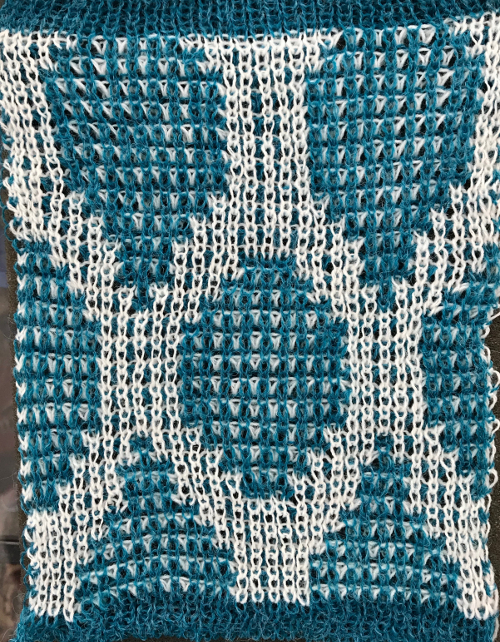 Using technique 130 will double the height of the repeat, working each row twice. 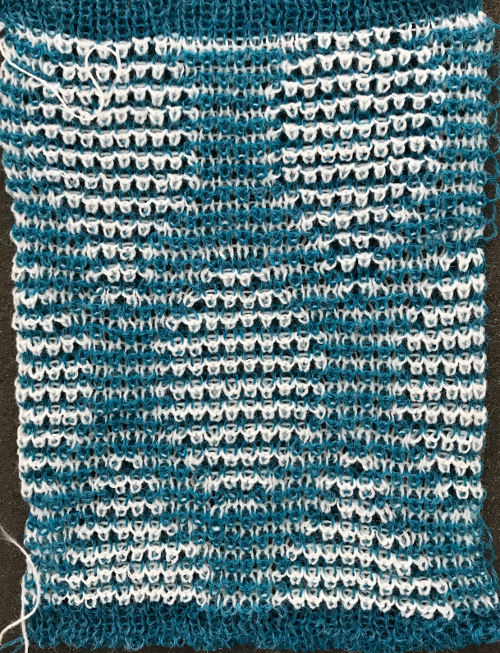 Below is my electronic repeat, 12 stitches by 56 rows in height. 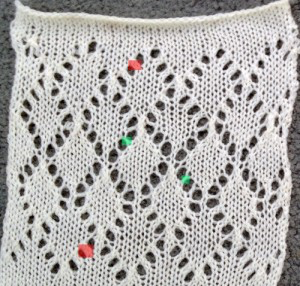 It is intended to mimic the work done by the pushers on the Passap. 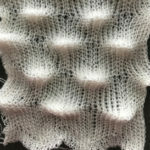 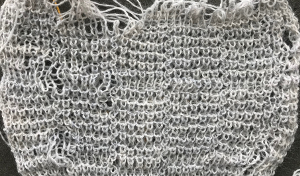 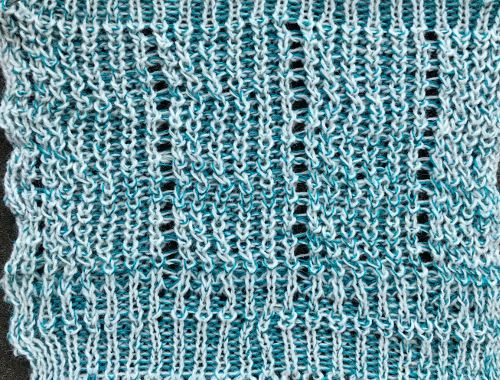 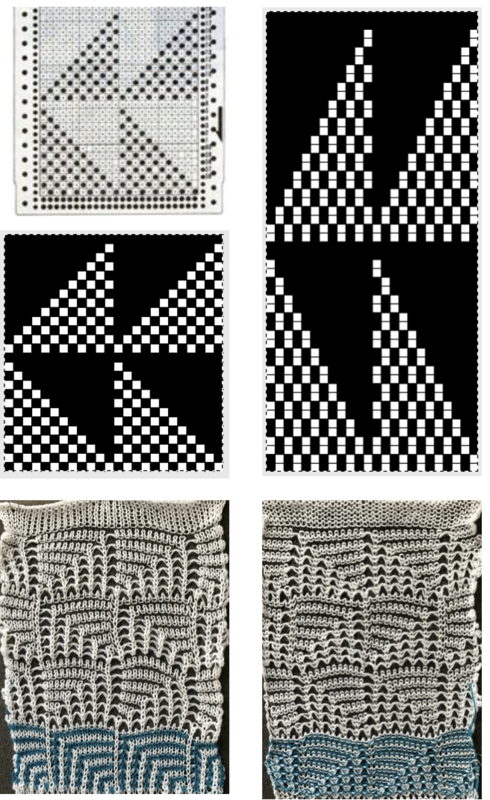 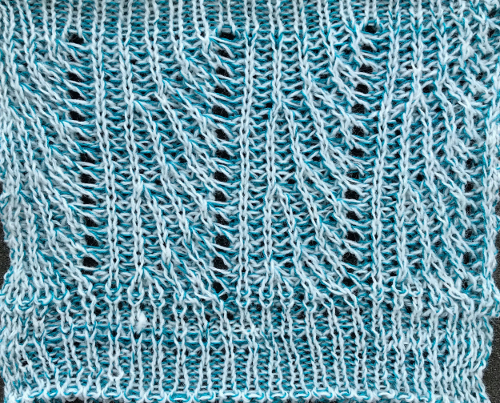 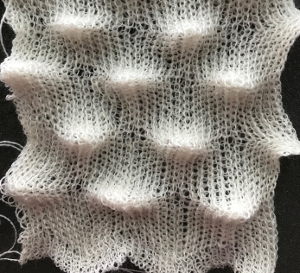 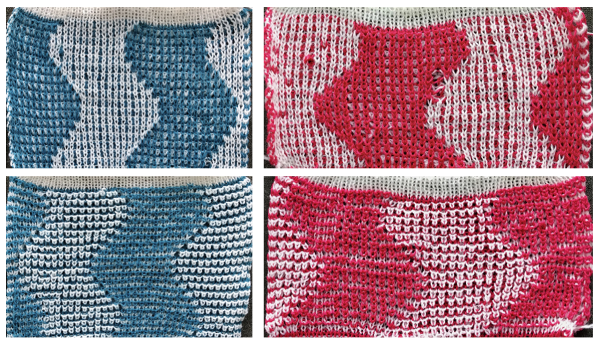 Alternate groups of 6 stitches will knit (black squares) or tuck (white squares) for 2 consecutive rows. 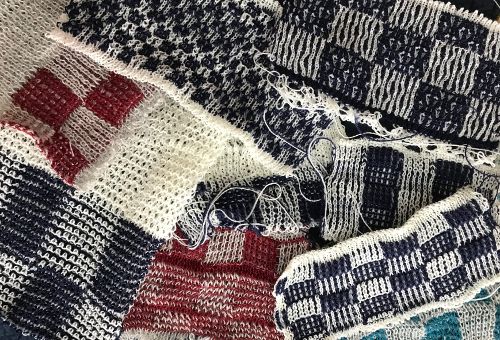 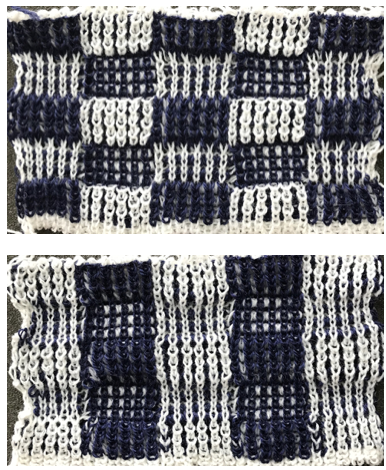 At the center and the top of the full repeat the two extra rows of squares result in alternate groups of stitches tucking or knitting for 4 rows, contributing to the shift in the color and texture of the checks. 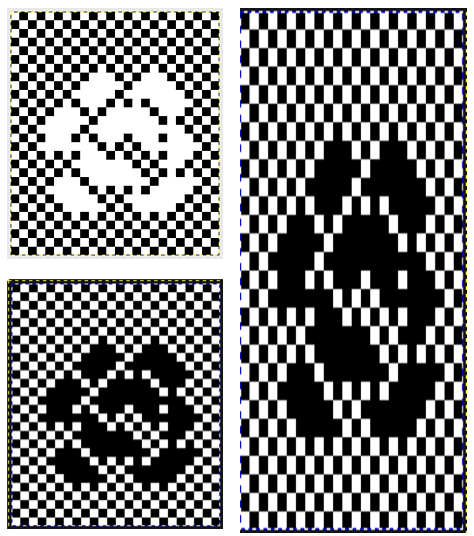 The FX setting is incorporated into several techniques used with KX, 104, 105, 112, 113, 167, 259, 260. 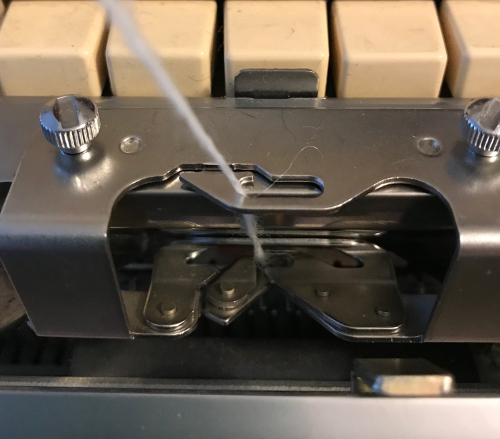 Some techniques adding back lock settings: 106, 114,145, 158, 167, 168, 190. 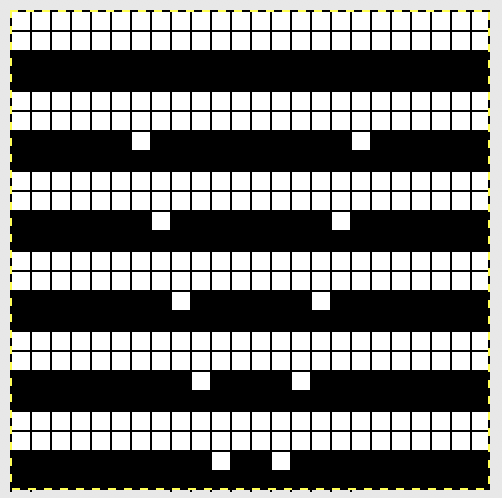 Techniques 259, 260, 269, 270 use racking; 200, 212 require manual changing of arrow keys; 284 uses the U100 transfer carriage in combination with fisherman rib for an embossed effect. 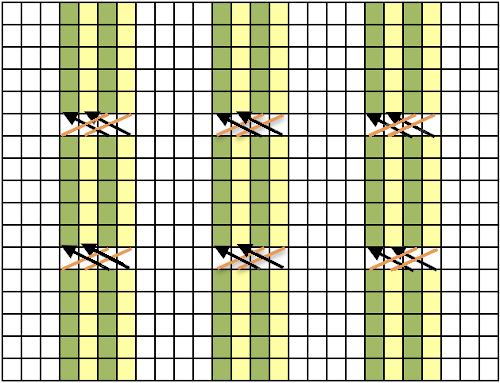 Using FX setting with pushers full fisherman rib can be combined with full needle rib or half fisherman rib on the opposite bed. There now is a 3d printed “device” for the Passaphttps://vimeo.com/101599762. 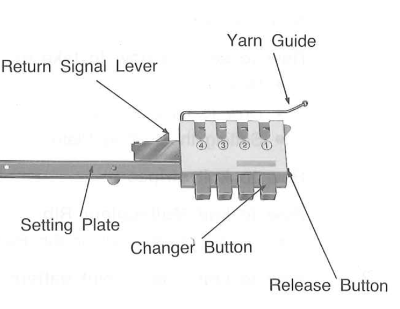 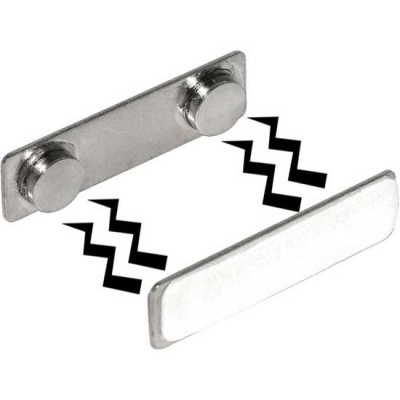 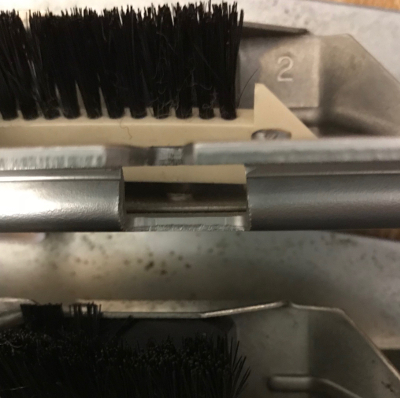 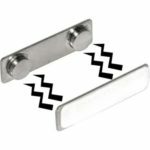 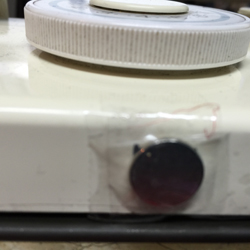 It as well as the earlier mercer plating device http://www.knittingparadise.com/t-396061-1.html require gluing or drilling to affix parts to locks, are not easily available. 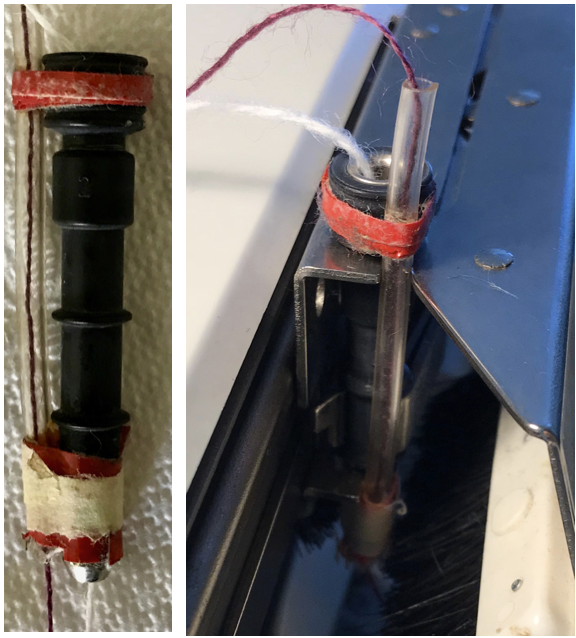 At one point in time I tested a far “simpler” version of a yarn feeder for a second, thinner yarn aiming for a plated effect, using a thin plastic tubing taped securely on a passap yarn feeder. 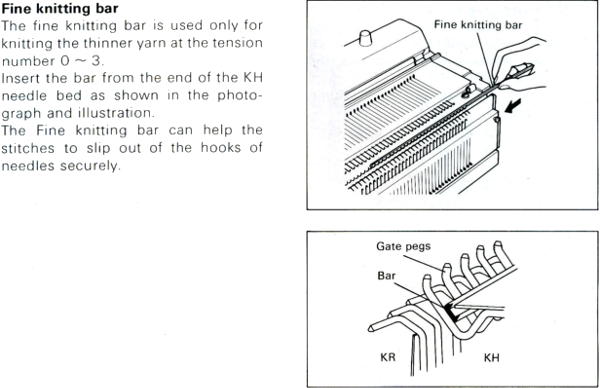 The goal is to keep the tubing clear of any needles as the locks move across the knitting beds. 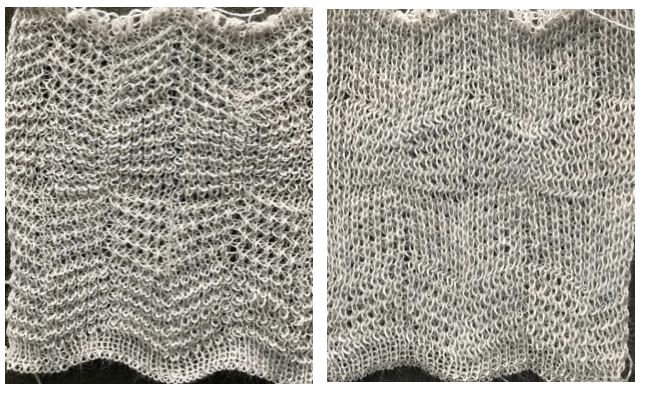 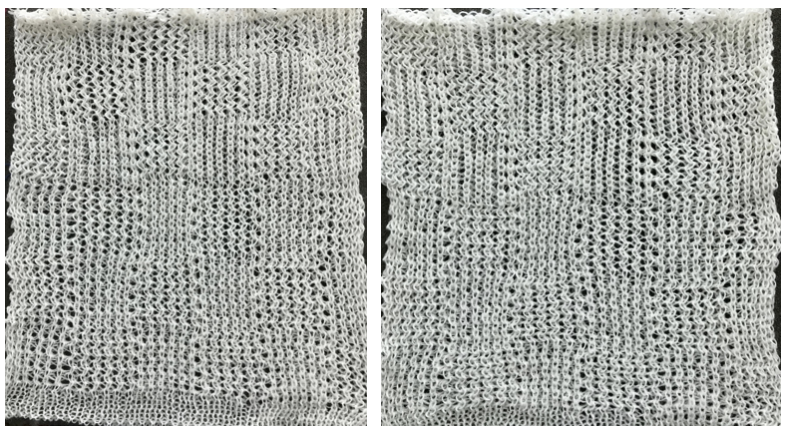 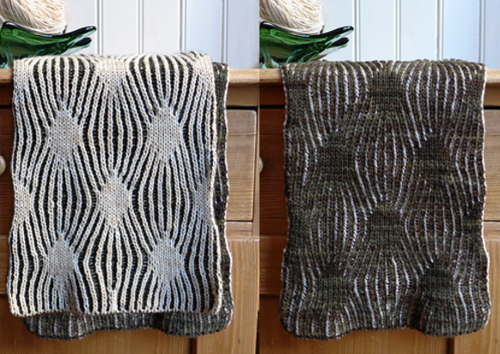 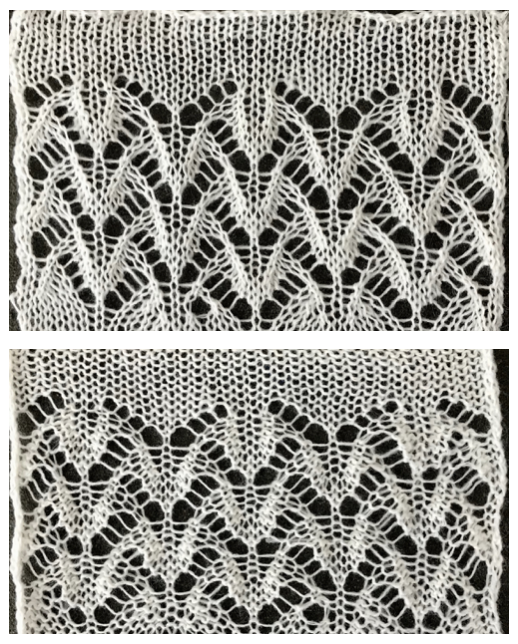 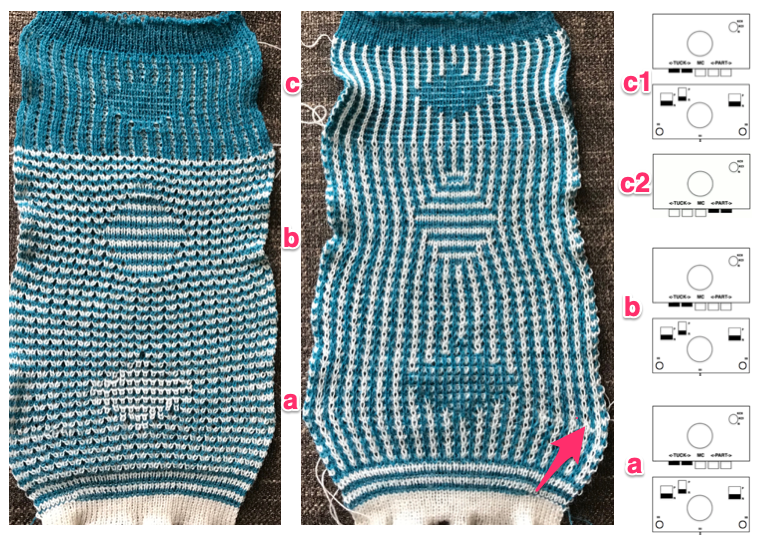 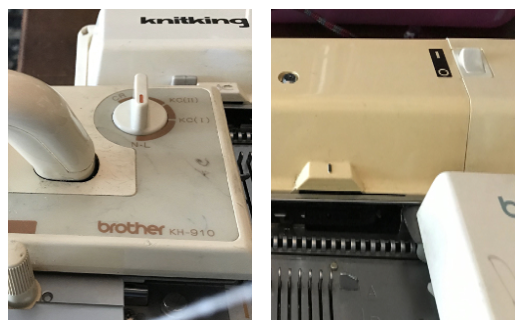 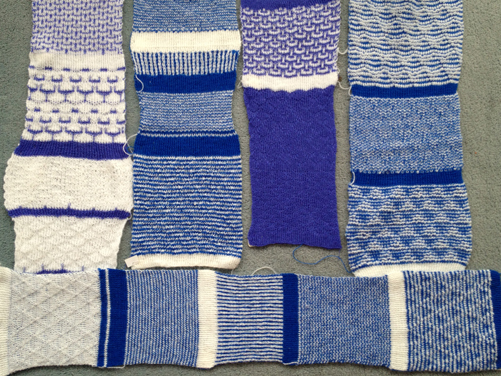 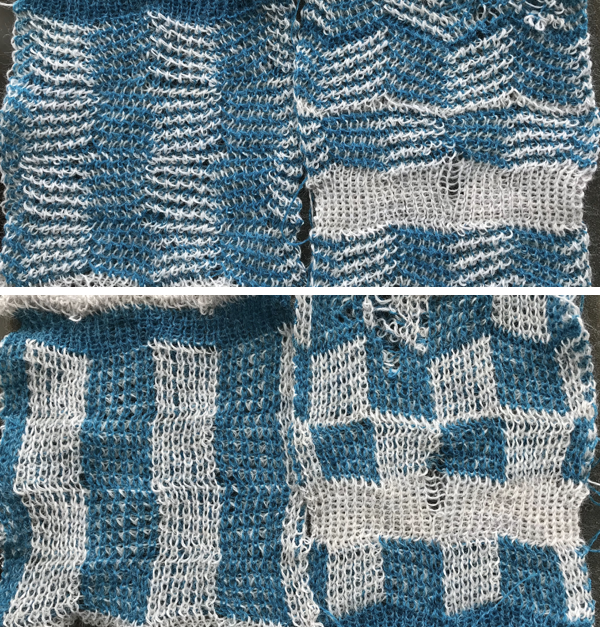 Samples were knit on Brother machine (left) and on Passap (right): on Brother needles were set up 2 in work, 2 out of work. 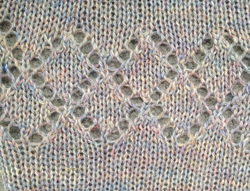 On the ribber an even number of needles were in work, with lili buttons in use, and the ribber carriage was set to tuck in both directions while the main bed remained set to knit throughout. 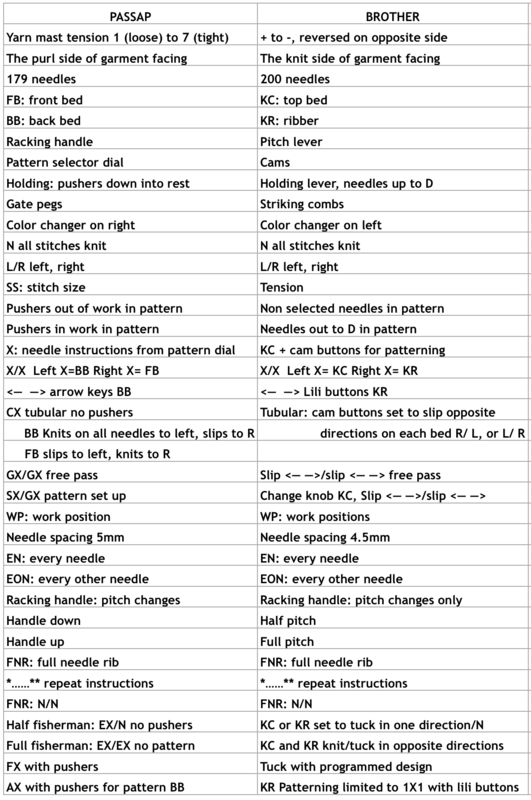 Passap had the 2 in work 2 out of on work needle arrangement on the front bed set to N, with pushers one up, one down, both arrow keys in AX (tuck setting) on the back bed, fabric is not “blocked” in any way.